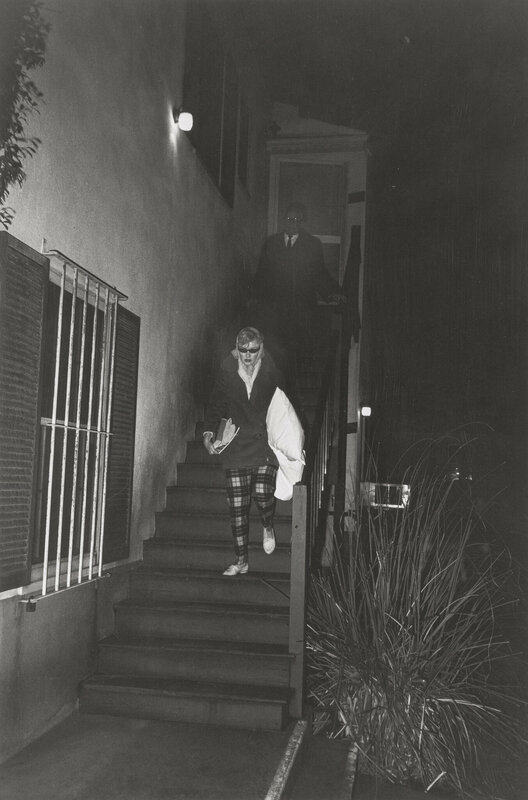 En décembre 1947, Marilyn Monroe emménage dans une petite maison au 4215 Rowland Street, à Burbank, en Californie. 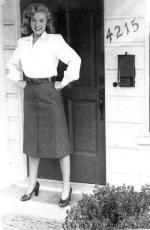 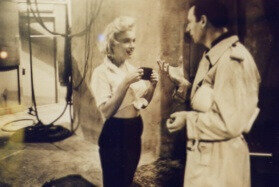 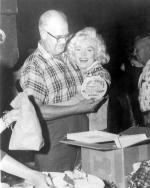 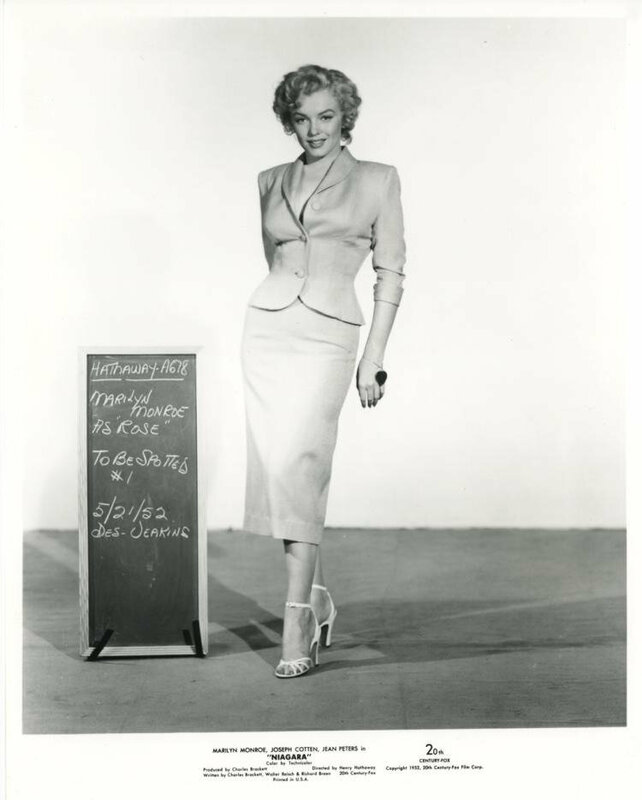 In December, 1947, Marilyn Monroe moves into a small house at 4215 Rowland Street, in Burbank, California. 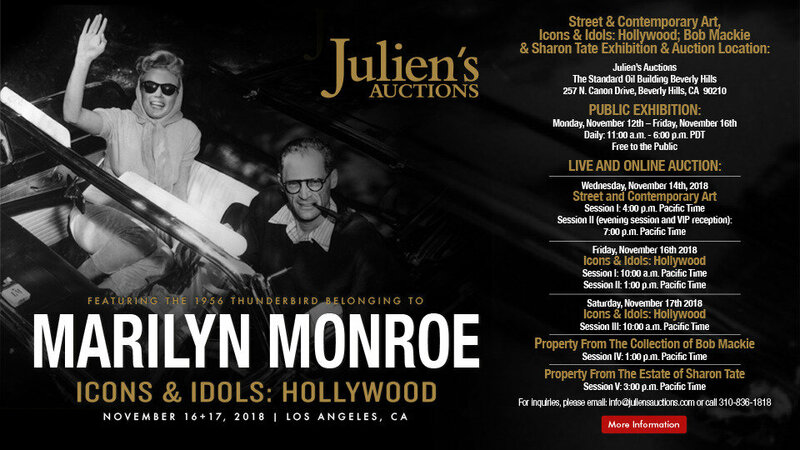 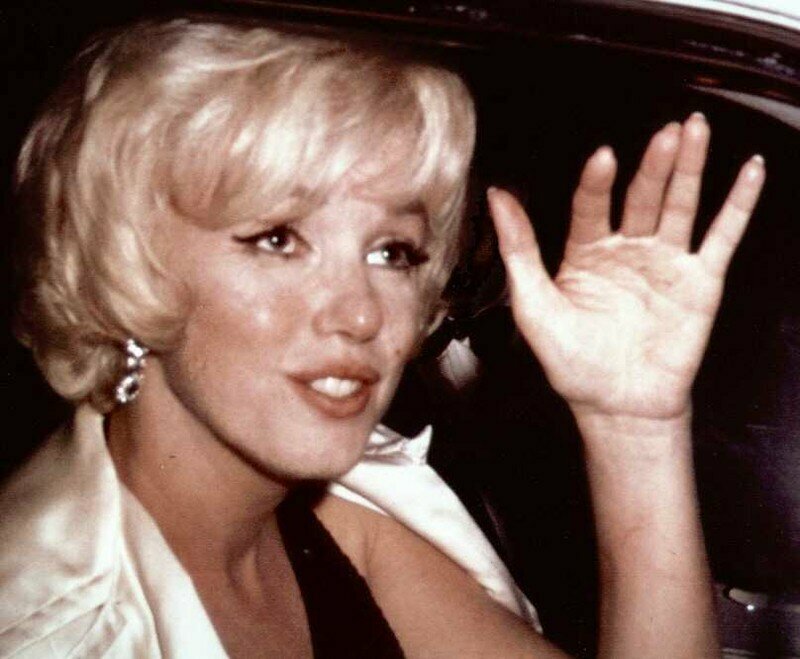 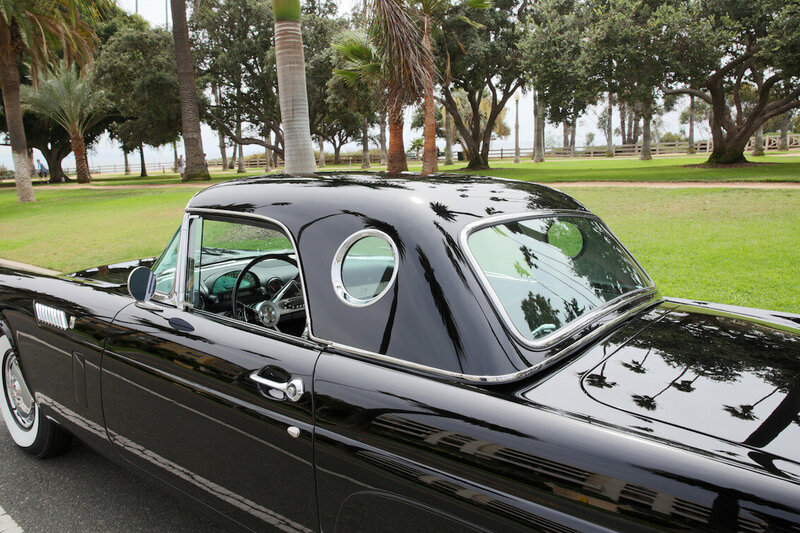 Les 16 et 17 novembre 2018, la vente aux enchères "Icons & Idols: Hollywood" organisée par Julien's Auction contiendra parmis ses lots la voiture Thunderbird que possédait Marilyn Monroe entre 1955 jusqu'en 1962. 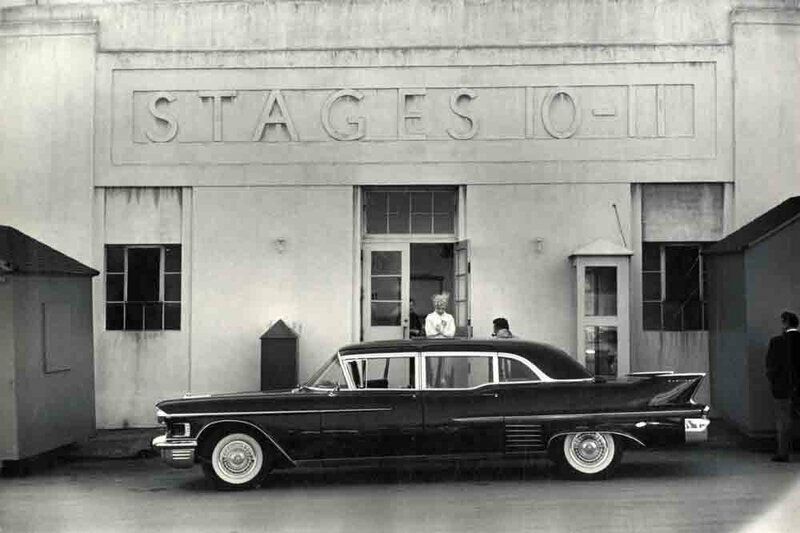 La Thunderbird décapotable de deux portes a été achetée le 20 décembre 1955 à Westport Motors (Westport- dans le Connecticut) sous le nom de sa société "Marilyn Monroe Productions" qu'elle avait créée avec son associé ami et photographe Milton Greene. Certains avancent le fait que la voiture seraitun cadeau de Noël de Greene. 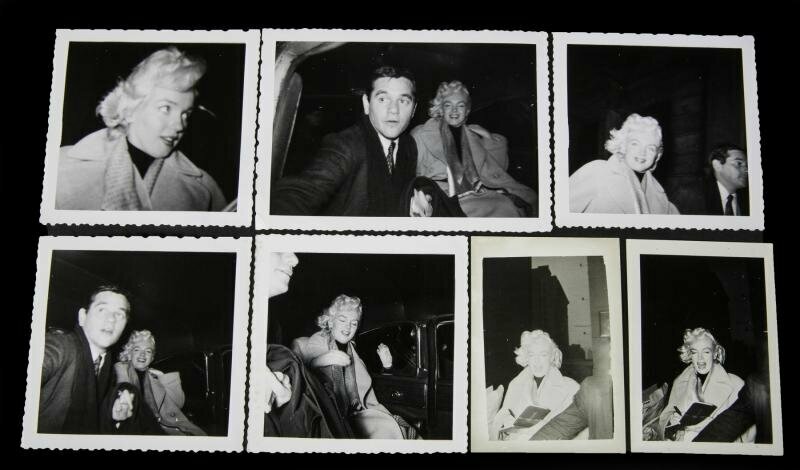 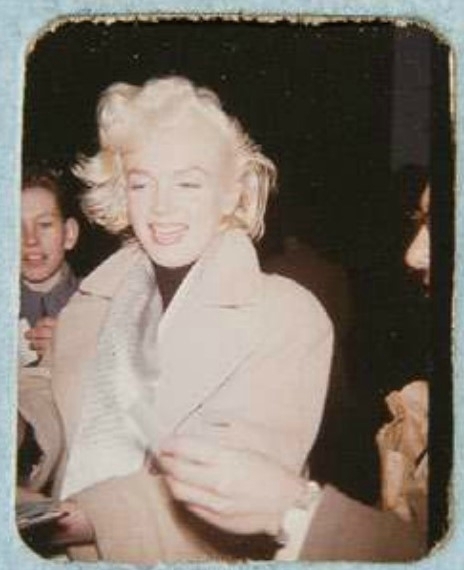 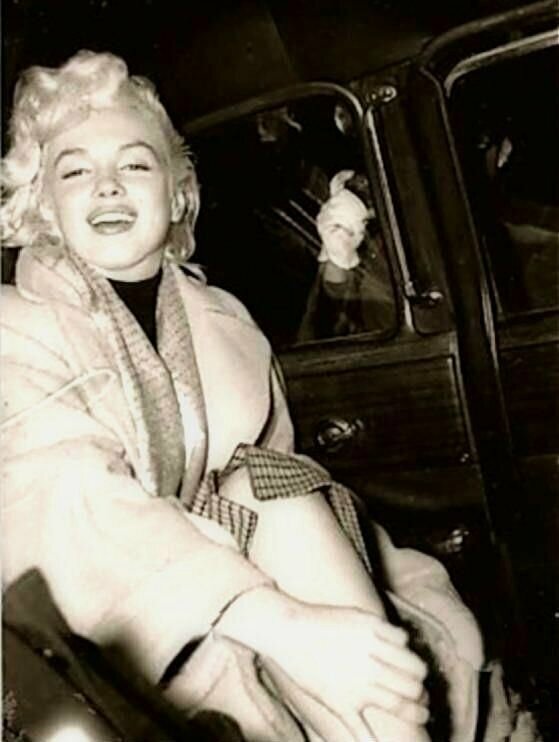 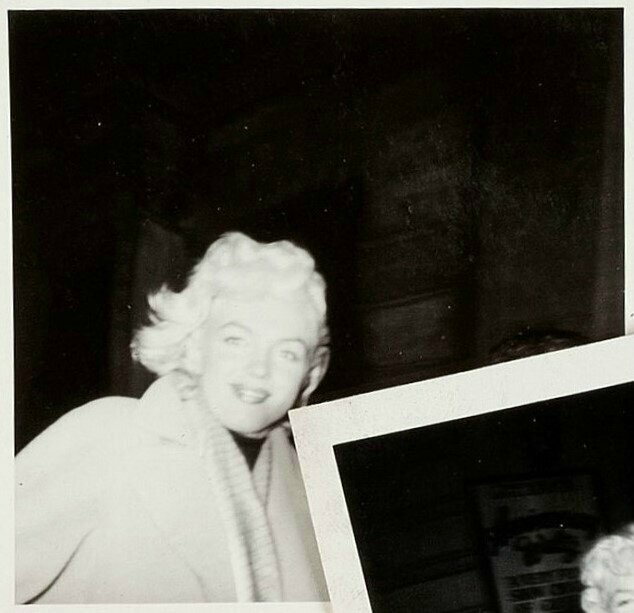 Marilyn est photographiée dans cette voiture avec Arthur Miller en 1956 (série de photos de Paul Schutzer, en route pour le Connecticut) et 1957 (série de photos à New York par Sam Shaw). 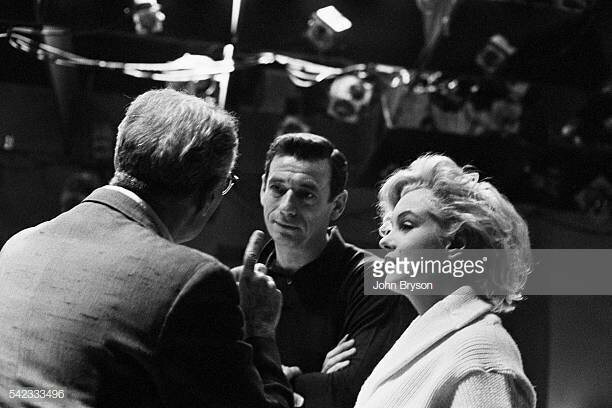 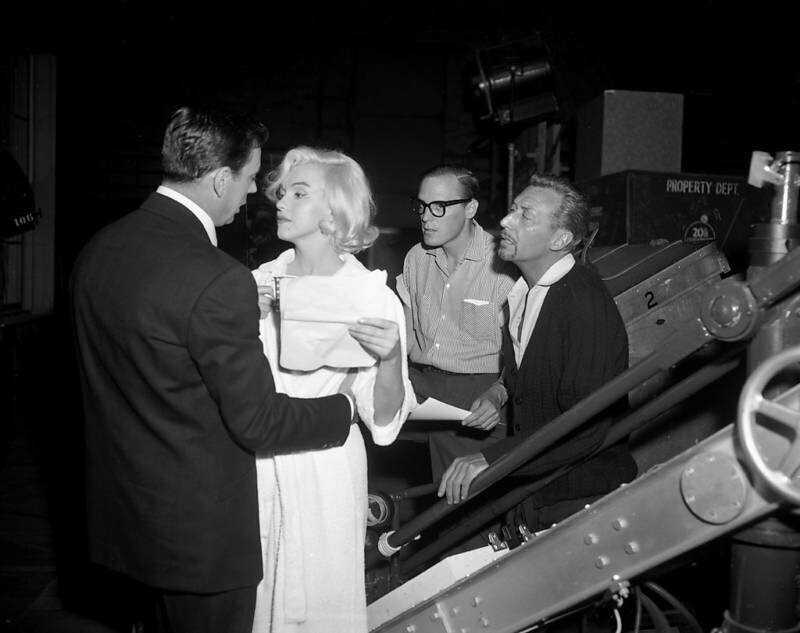 On y apprend que Marilyn l'avait offerte, peu de temps avant sa mort survenue le 5 août 1962, à John Strasberg (le fils de Lee et Paula Strasberg, ses mentors de l'Actors Studio) qui fêtait ses 18 ans. Marilyn Monroe répète les numéros de danses du chorégraphe Jack Cole pour le film "Let's Make Love" ("Le Milliardaire") - fin 1959 / début 1960. 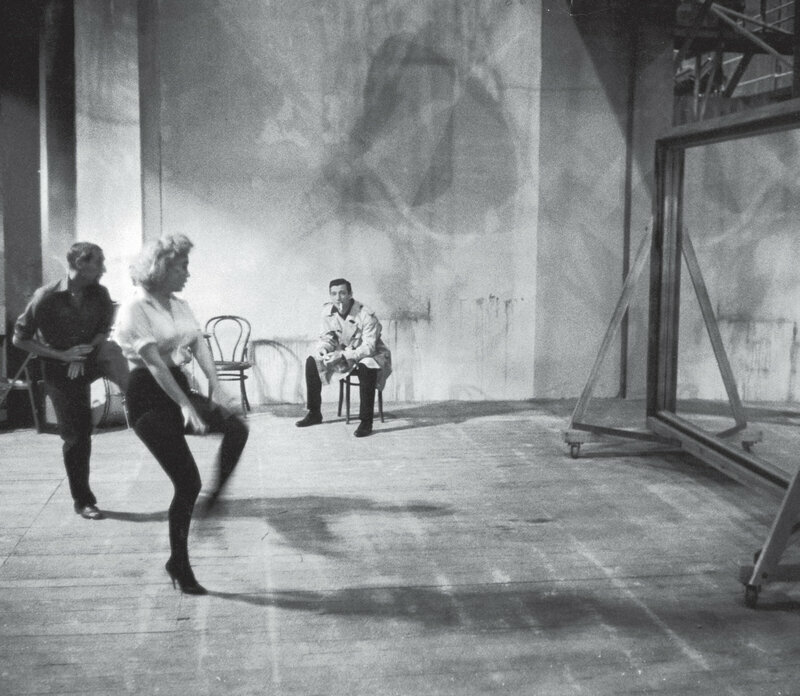 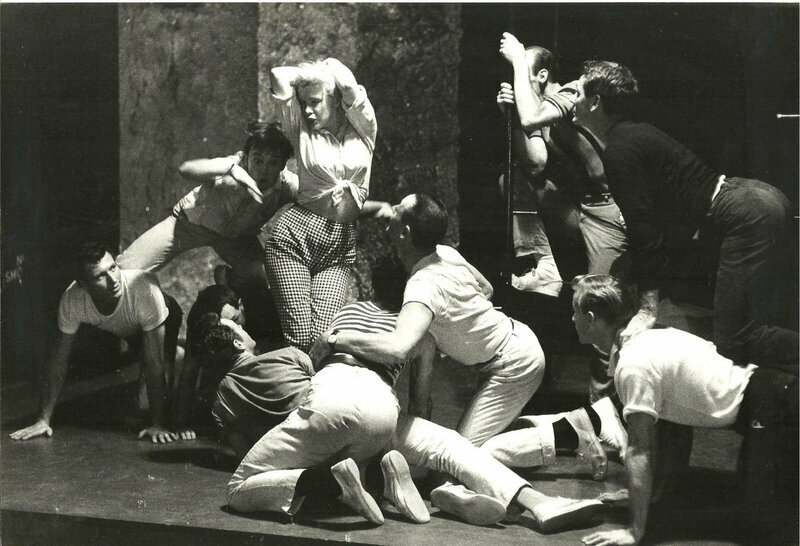 Marilyn Monroe rehearses the dance numbers of the choreographer Jack Cole for the movie "Let's Make Love", end 1959 / beginning 1960.
répétition / rehearsals: "My Heart Belongs To Daddy"
Marilyn Monroe sur le tournage du film "Let's Make Love" ("Le Milliardaire") fin 1959 / début 1960. 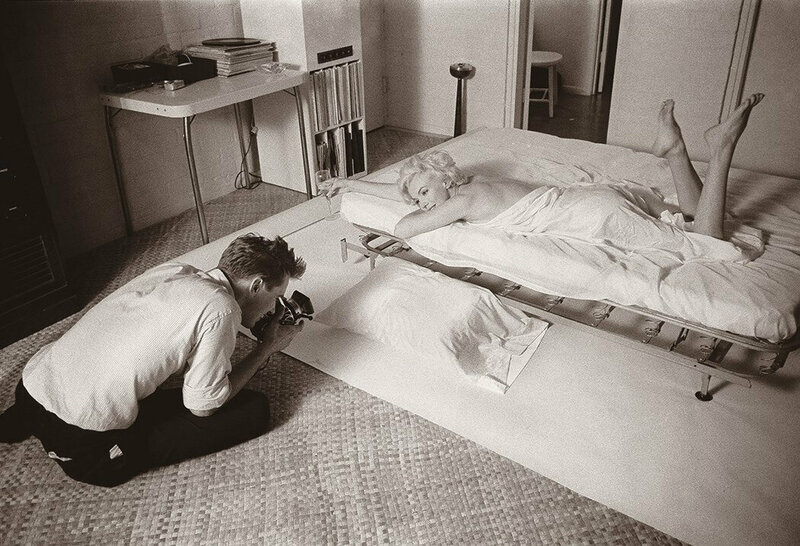 Marilyn Monroe on the set of "Let's Make Love" end 1959 / beginning 1960.
le journaliste Stephane Groueff, envoyé par Paris Match. 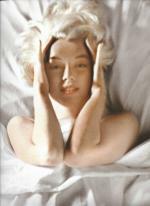 Stephane Groueff, send by French magazine Paris Match. 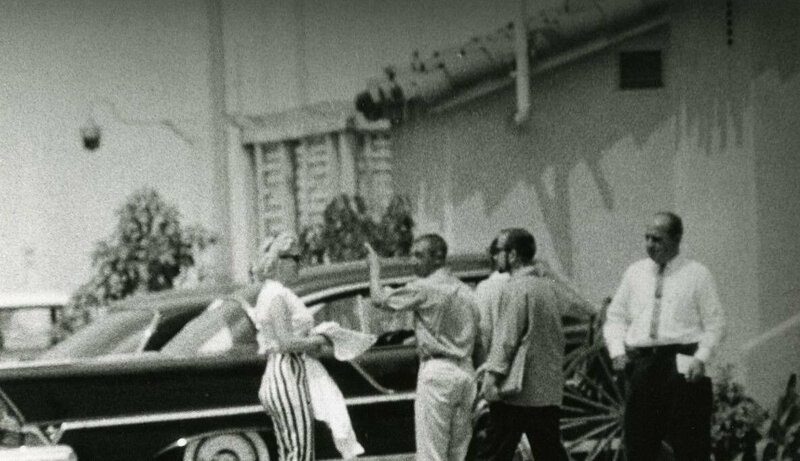 Le 12 novembre 1959, Marilyn Monroe quitte le Beverly Hills Hotel pour se rendre aux studios de la Fox sur le tournage de "Let's Make Love" ("Le Milliardaire"). 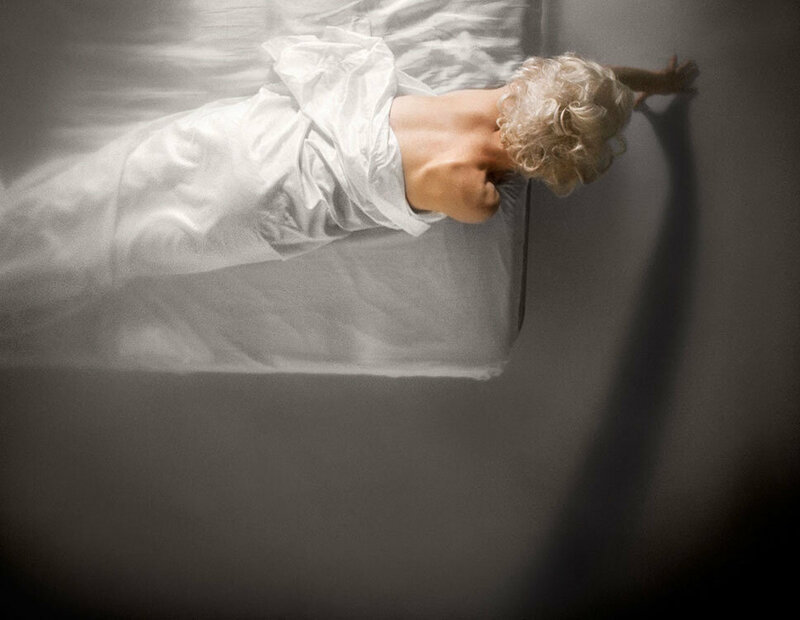 Photographies de John Bryson. 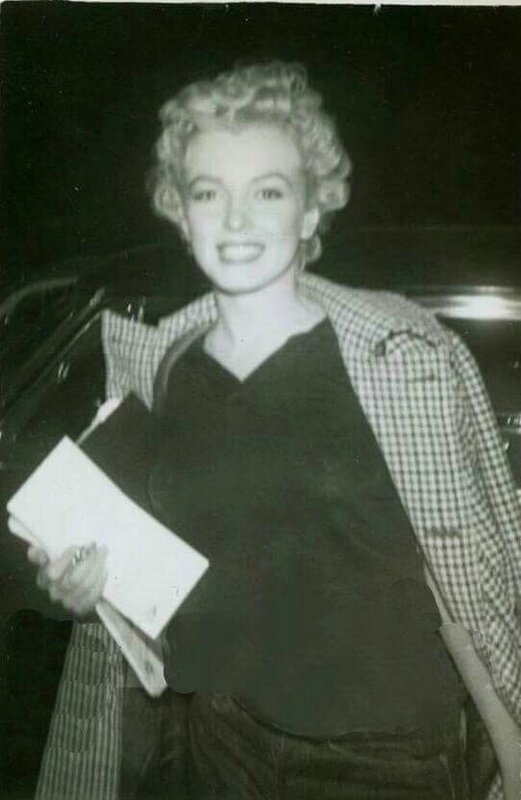 On November, 12, 1959, Marilyn Monroe leaves the Beverly Hills Hotel to go to the Fox Studios on the set of "Let's Make Love". 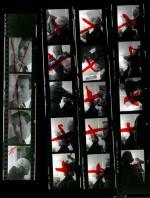 Photographs by John Bryson. 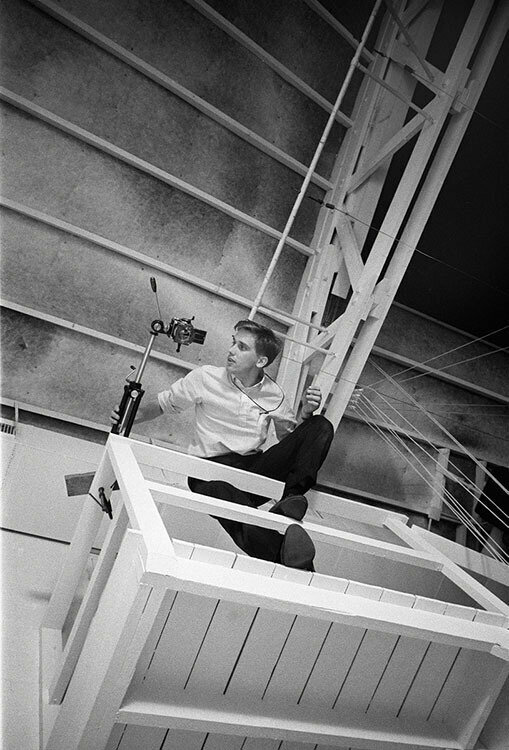 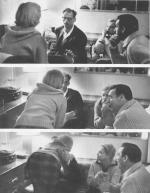 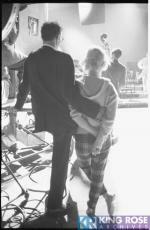 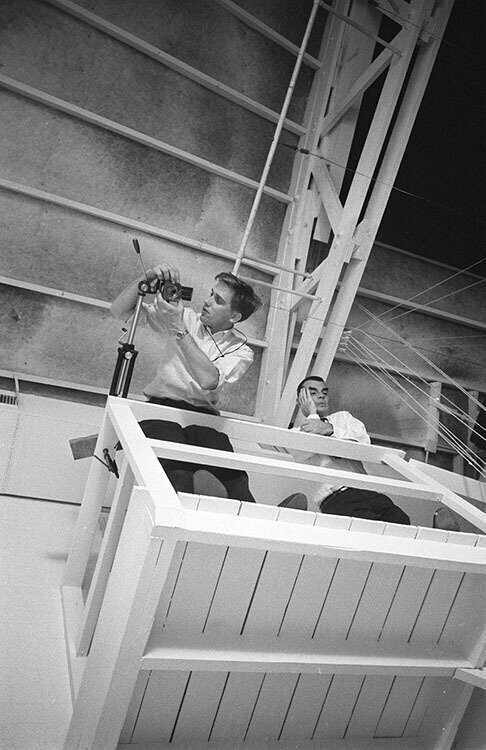 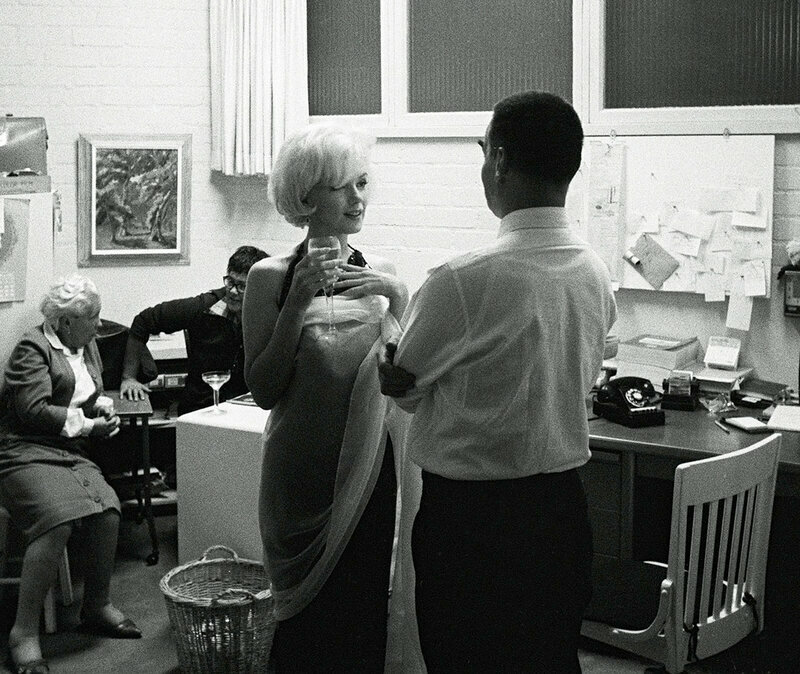 Le vendredi 17 novembre 1961, dans un studio loué à Hollywood (le studio John Engstead sur Santa Monica Boulevard), le photographe Douglas Kirkland et ses assistants préparent la venue de Marilyn Monroe: du champagne Dom Perignon au frais, et des disques de Frank Sinatra. 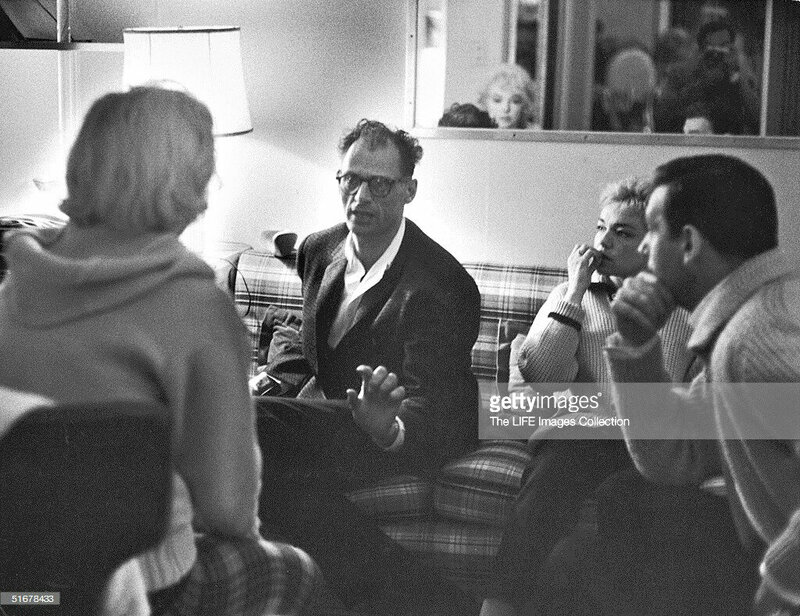 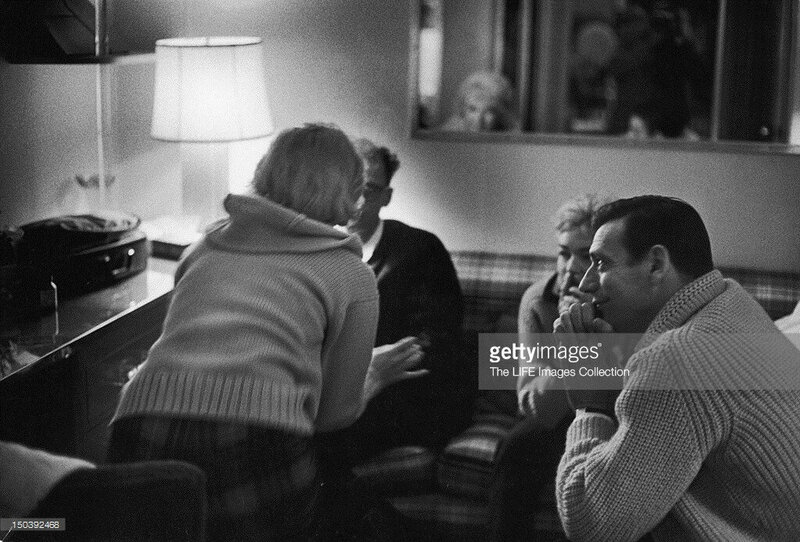 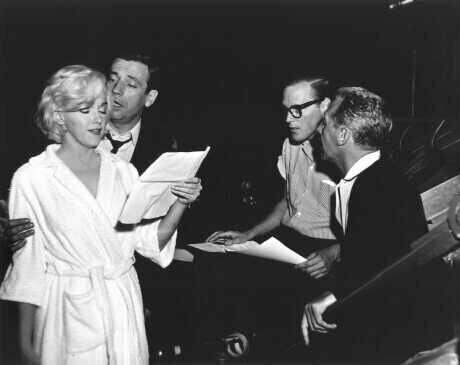 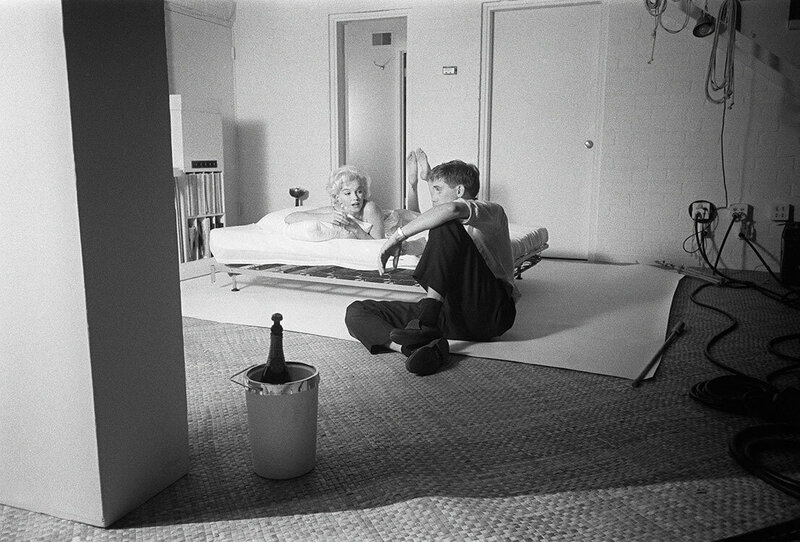 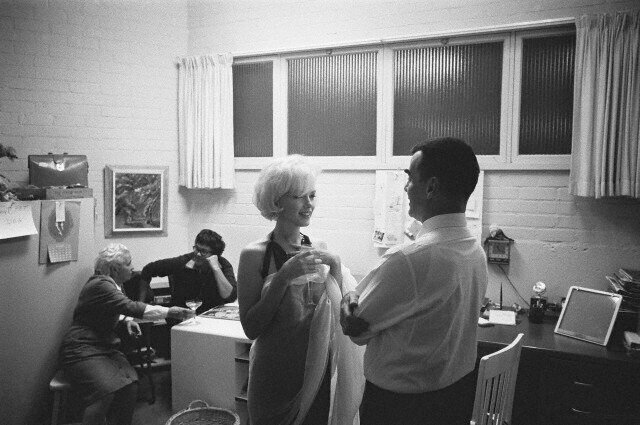 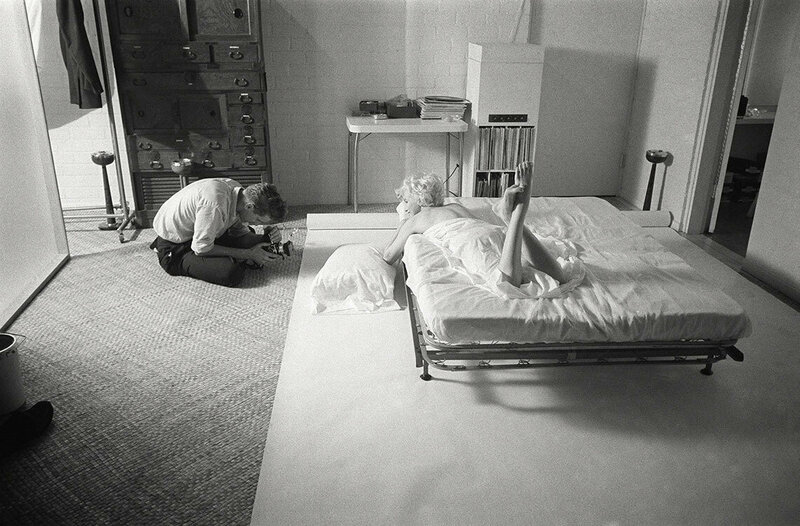 On Friday, November, 17, 1961, in a studio rented in Hollywood (the John Engstead Studio on Santa Monica Boulevard), the photographer Douglas Kirkland and his assistants prepare the arrival of Marilyn Monroe: champagne Dom Perignon in the fridge, and records by Frank Sinatra. 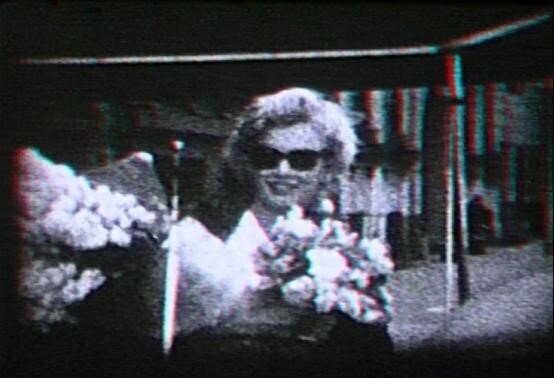 Le rendez-vous est fixé à 19h, mais Marilyn arrive à 21h30. 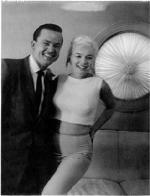 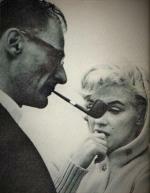 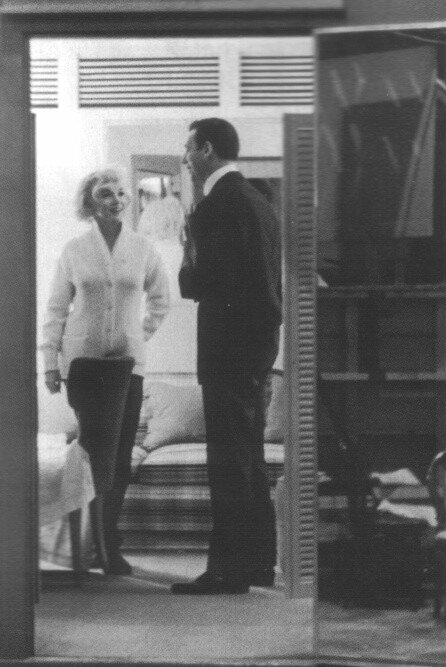 D'ailleurs, l'agent de Marilyn, John Springer, avait prévenu Kirkland et son associé, l'écrivain Jack Hamilton: "Elle arrive parfois en retard mais elle finit toujours par arriver." 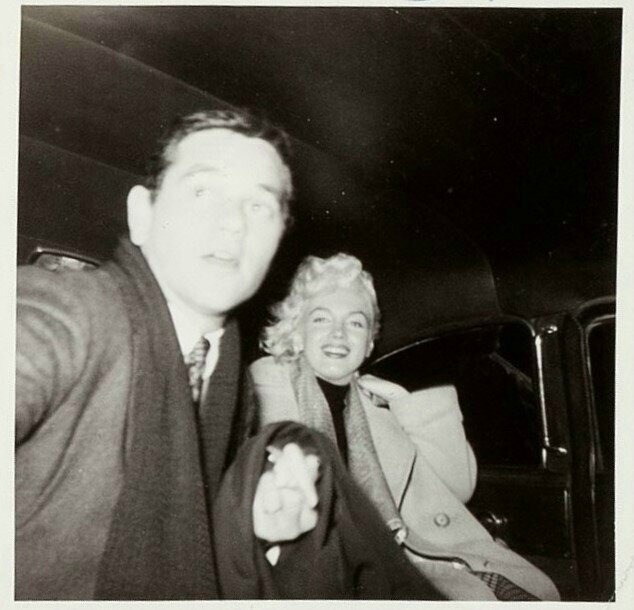 Marilyn est accompagnée de deux assistantes: l'une s'occupe de la coiffure et du maquillage (Agnes Flanagan), l'autre est son habilleuse, portant un sac de vêtements. Parmi les autres personnes présentes: John Springer, Jack Hamilton, un assistant et le responsable du studio. 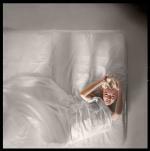 Kirkland a installé un appareil photo sur le petit balcon pour photographier le lit en plongée. 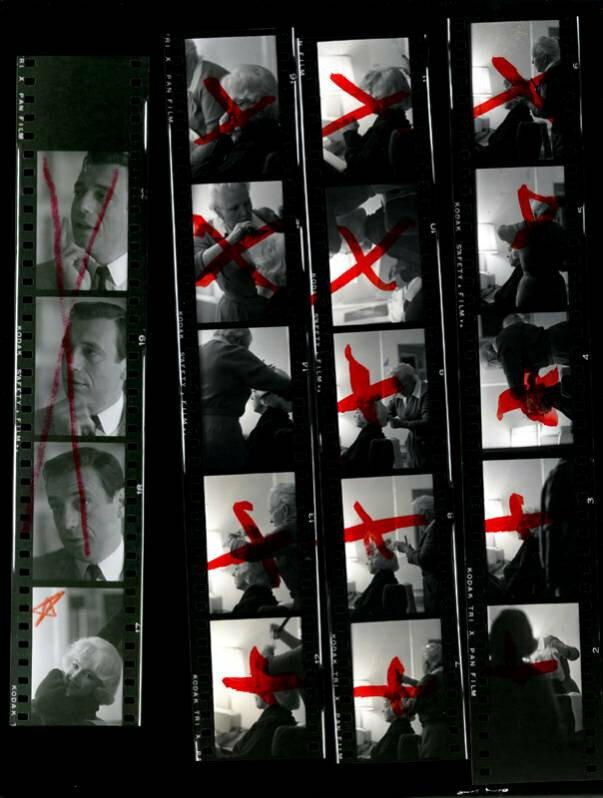 Mais il ne sait pas encore comment il veut la photographier: il a l'idée d'utiliser d'abord une grande étoffe blanche. Marilyn n'est pas emballée mais se prête au jeu en enfilant l'une des robes qu'elle a apportée. 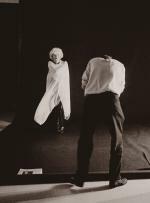 La séance se révèle inefficace. 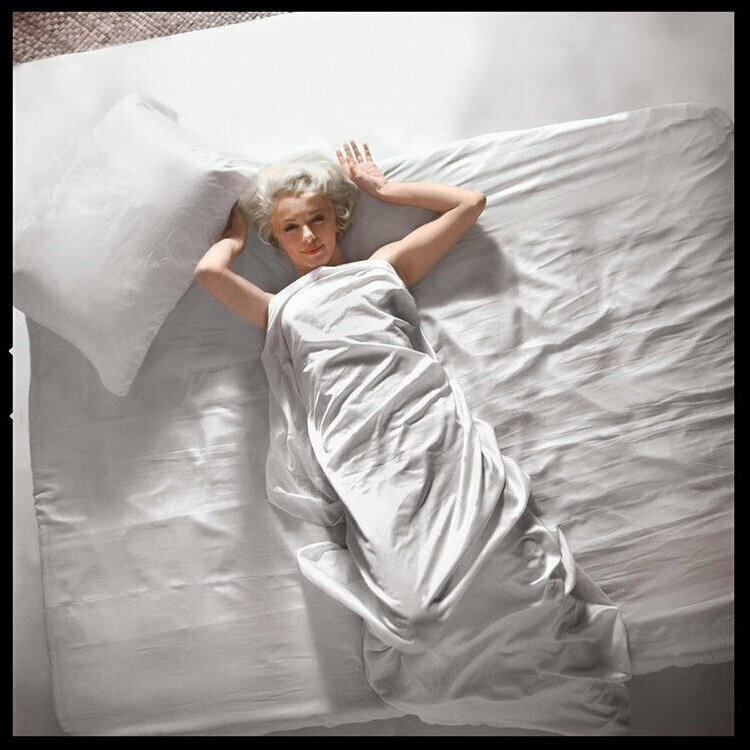 Marilyn et Kirkland trouvent le tissu trop ordinaire: "Je ne suis pas du genre à porter de la toile au rabais !" 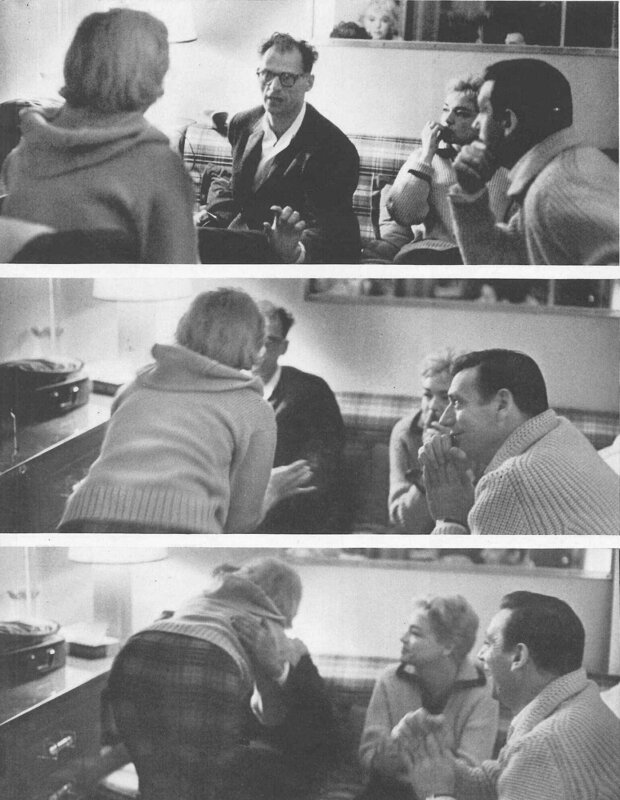 Ils font alors une pause pour réorganiser la séance. 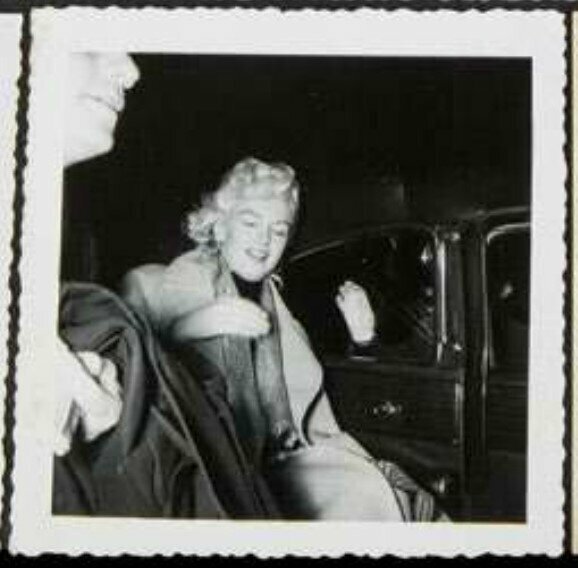 The appointment is fixed at 7 pm, but Marilyn arrives at 9:30 pm. 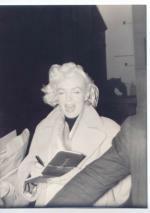 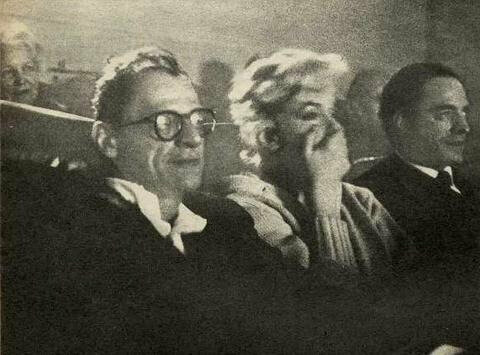 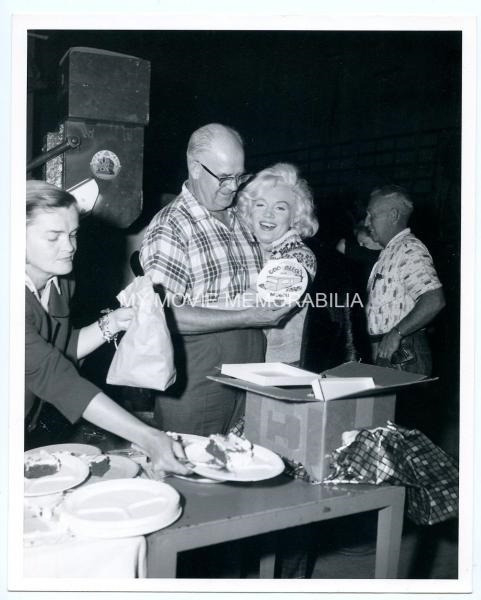 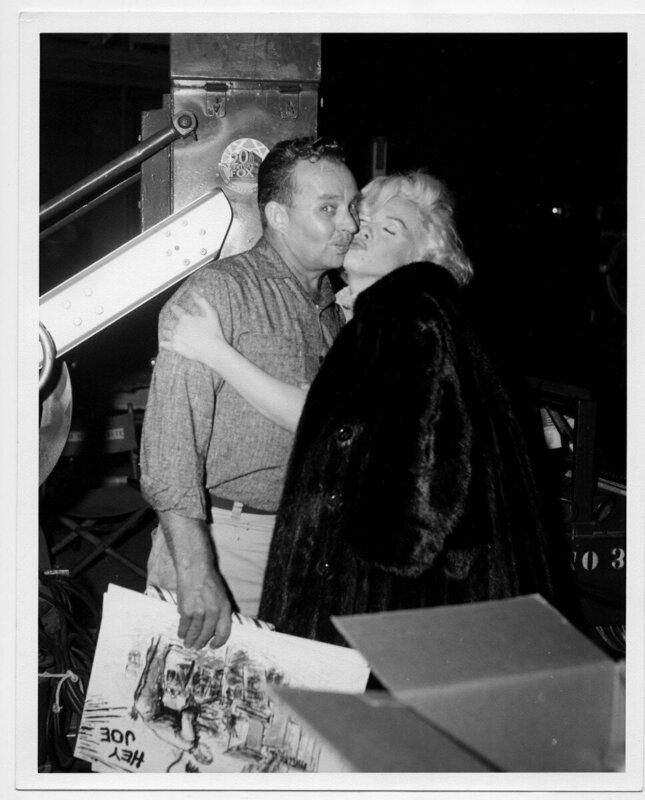 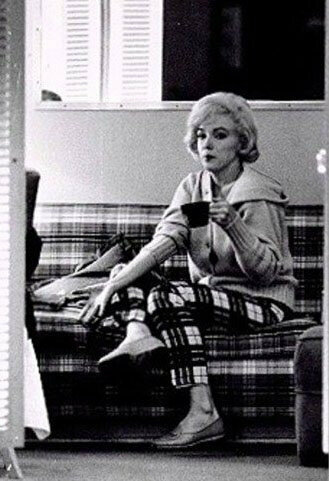 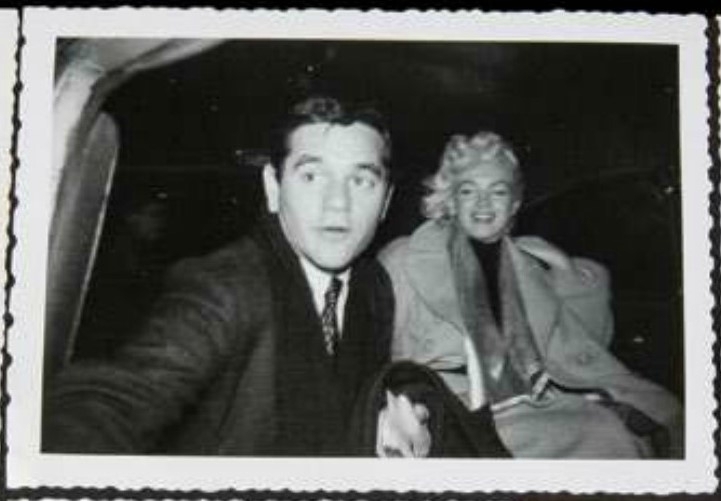 Anyway, Marilyn's agent, John Springer, had informed Kirkland and his associate, writer Jack Hamilton: "She sometimes arrives late but she always ends up arriving." 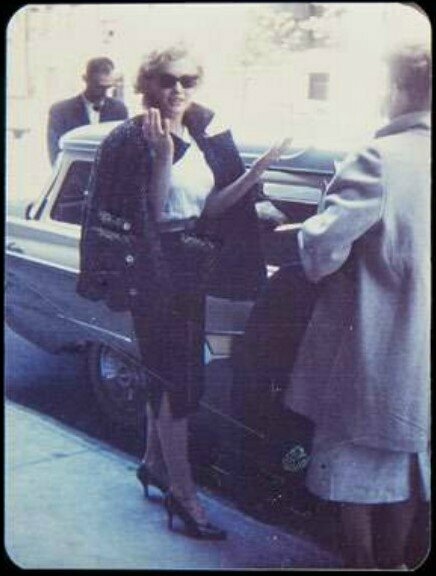 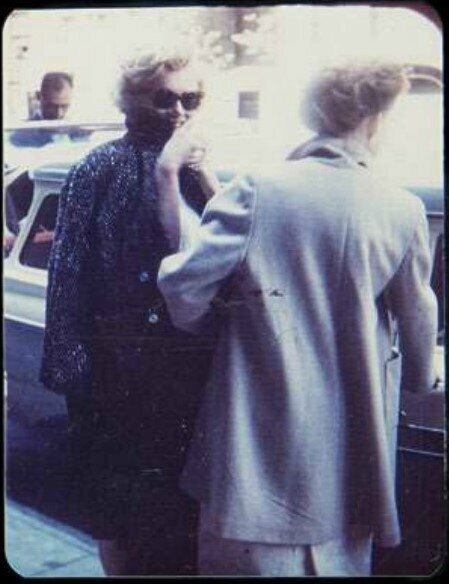 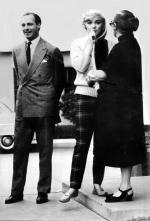 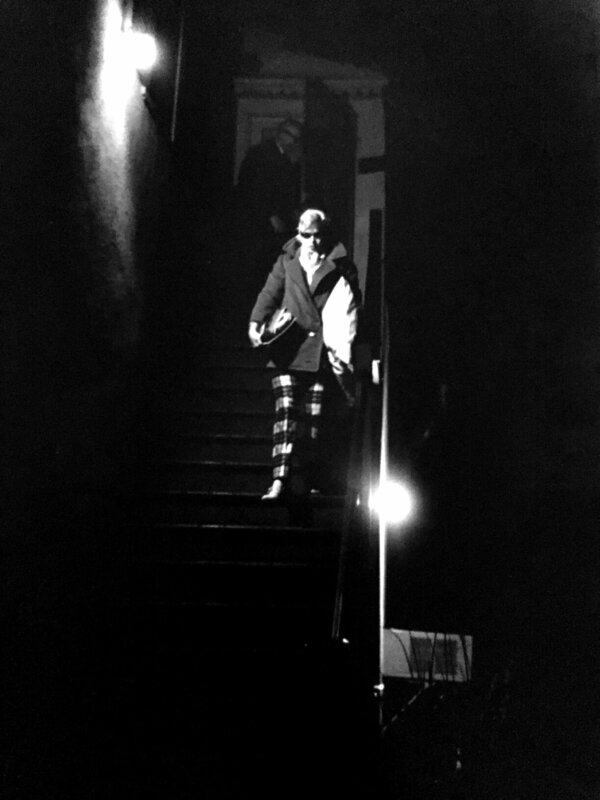 Marilyn is accompanied by two assistants: one is in charge of hair and make-up (Agnes Flanagan), the other is her dressmaker, carrying a bag of clothes. 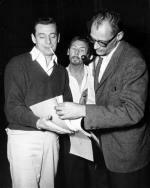 The other persons are John Springer, Jack Hamilton, an assistant, and the studio manager. 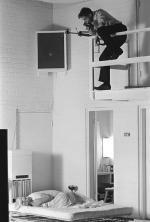 Kirkland installed a camera on the small balcony to photograph the bed. 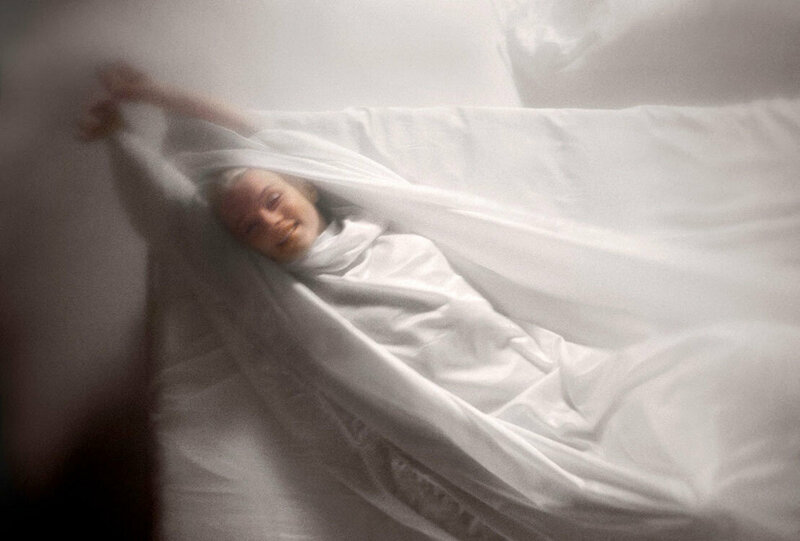 But he doesn't know yet how he wants to photograph her: he has the idea of ​​using first a large white fabric. 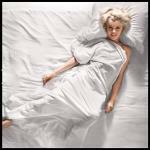 Marilyn is not excited but she is ready to try and by putting on one of the dresses she has brought. 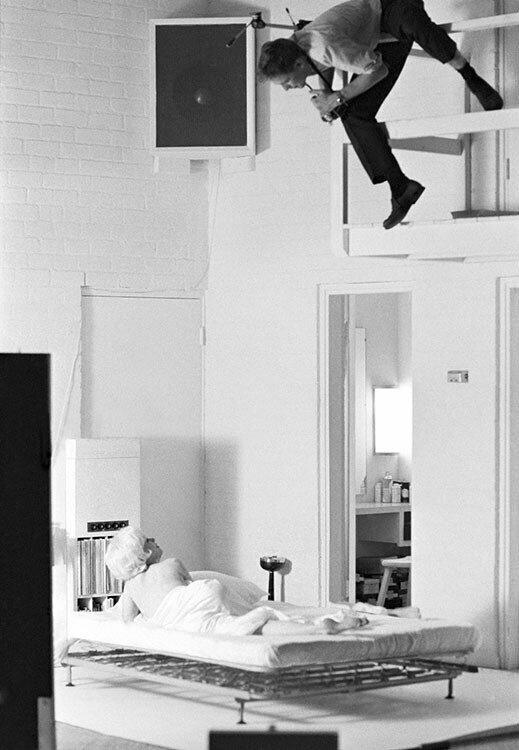 The setting is ineffective. Marilyn and Kirkland find the fabric too ordinary: "I'm not the one to wear cheap clothes !" 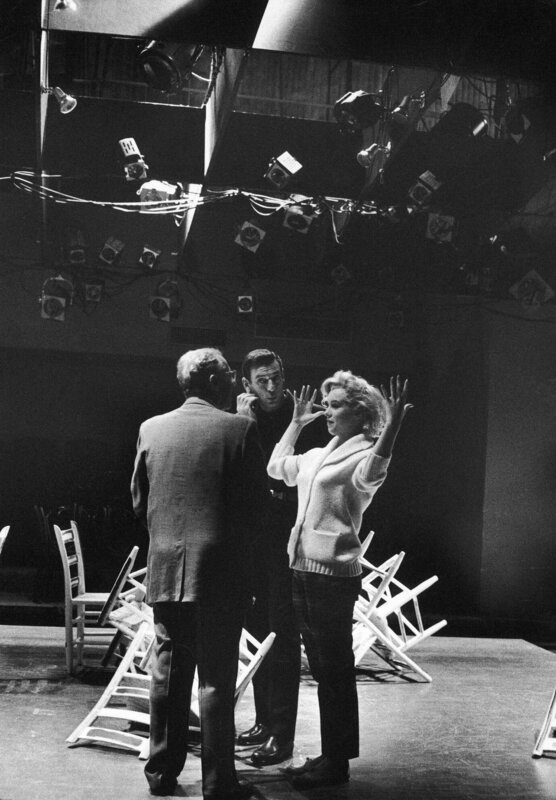 They then make a break to reorganize the session. 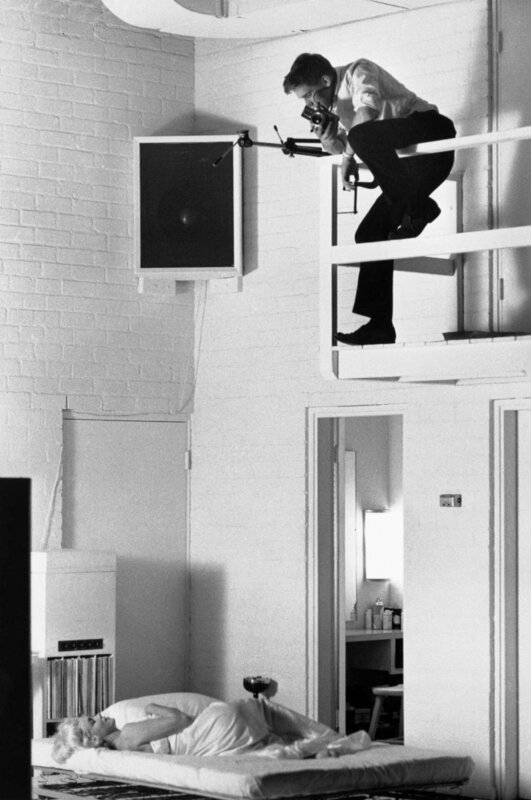 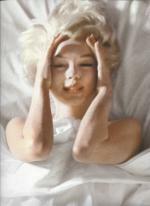 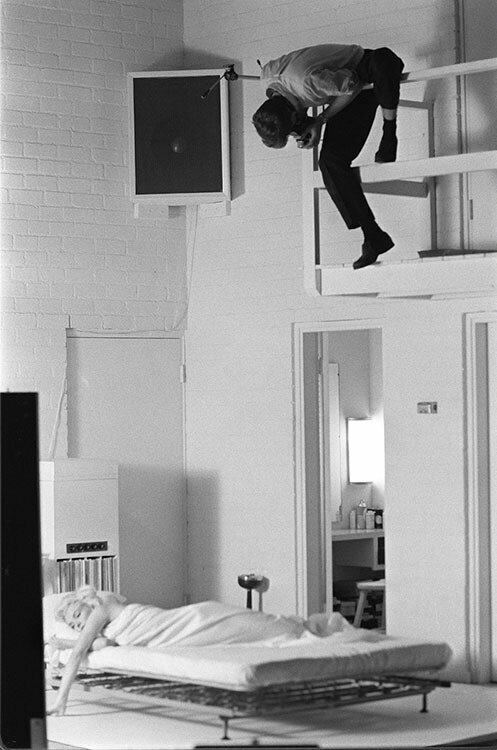 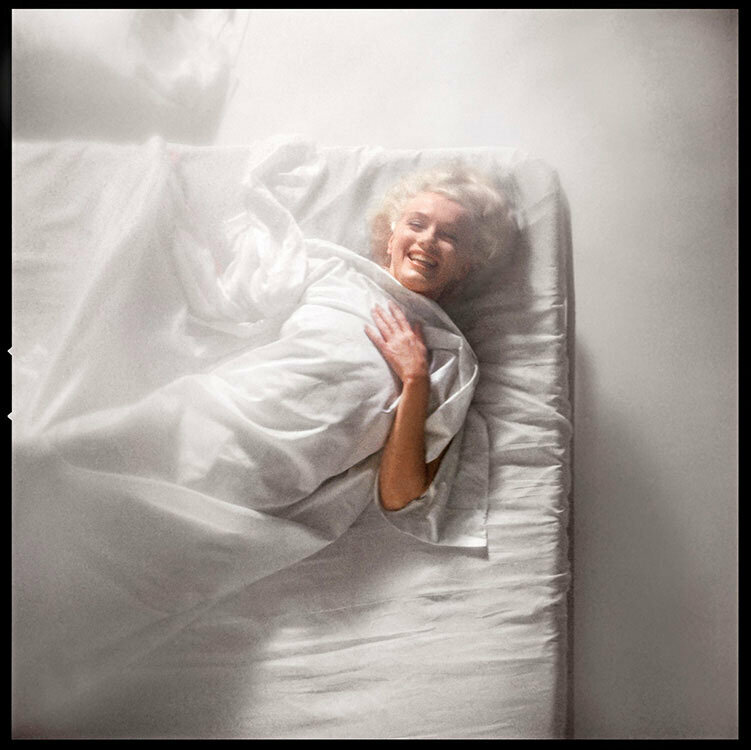 Douglas Kirkland amène Marilyn vers le lit défait de draps de soie blanche en lui demandant d'imaginer comment elle aimerait qu'on se souvienne d'elle dans 25 ans, puisque la photo devait fêtait le 25ème anniversaire du magazine Look. 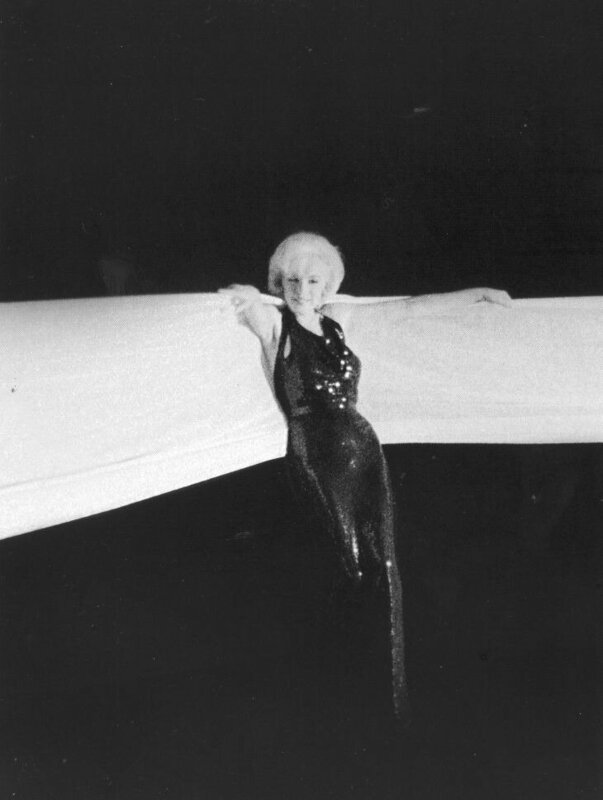 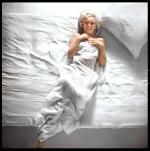 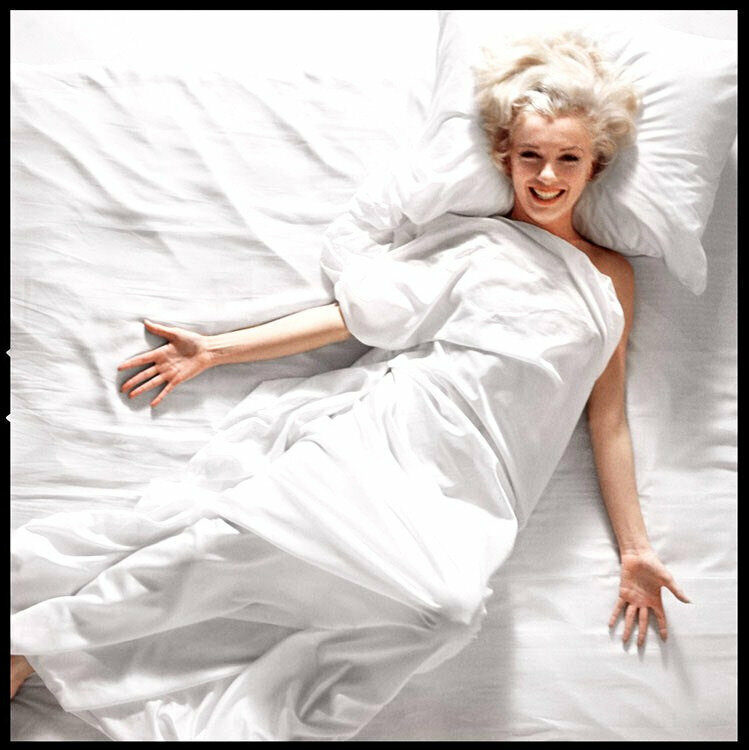 Marilyn retourne dans sa loge et y ressort en peignoir blanc qu'elle retire pour se glisser dans les draps de soie. 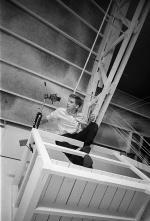 Pendant que Kirkland la photographie, perché du balcon, elle boit quelques gorgées de champagne. Parfois Kirkland s'arrête et boit avec elle. 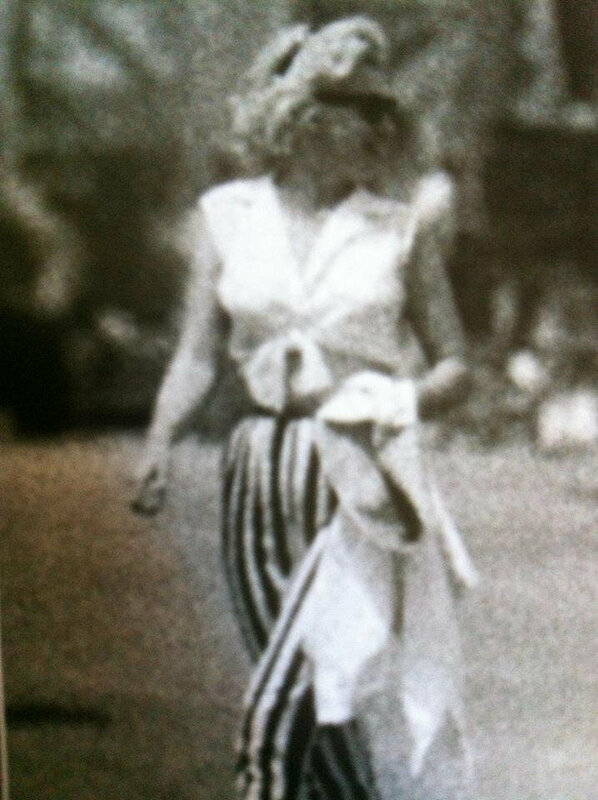 En pleine séance, elle demande au reste de l'équipe de la laisser seule avec le photographe: "D'habitude, ça marche mieux comme ça !" 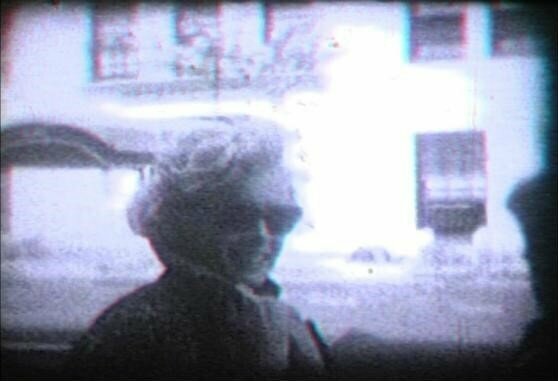 Pour Kirkland, ce fut alors "Une expérience très intime (...) Tout se jouait désormais entre Marilyn, mon appareil et moi. 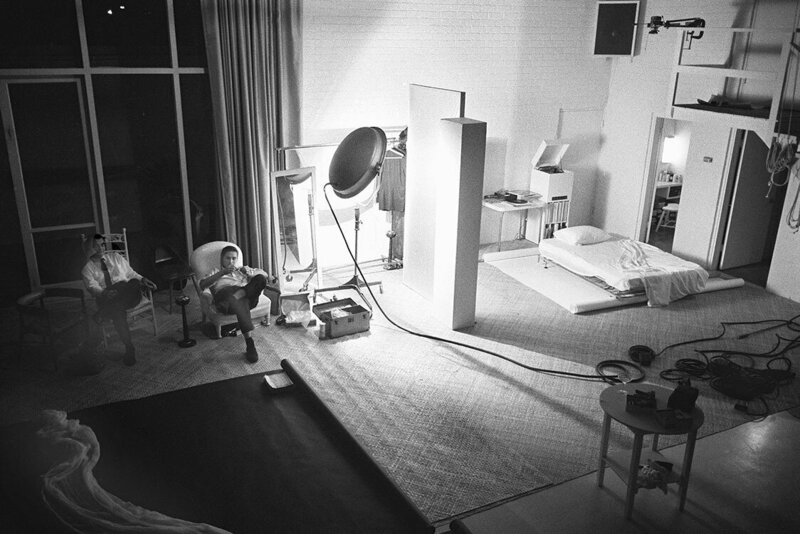 (...) L'ambiance était calme, douce et séduisante." D'après Kirkland, Marilyn lui demande en pleine séance qu'il la rejoigne dans le lit; il explique que bien qu'il en avait très envie, il était alors marié et père de trois enfants et sa bonne conscience lui fait refuser la proposition. 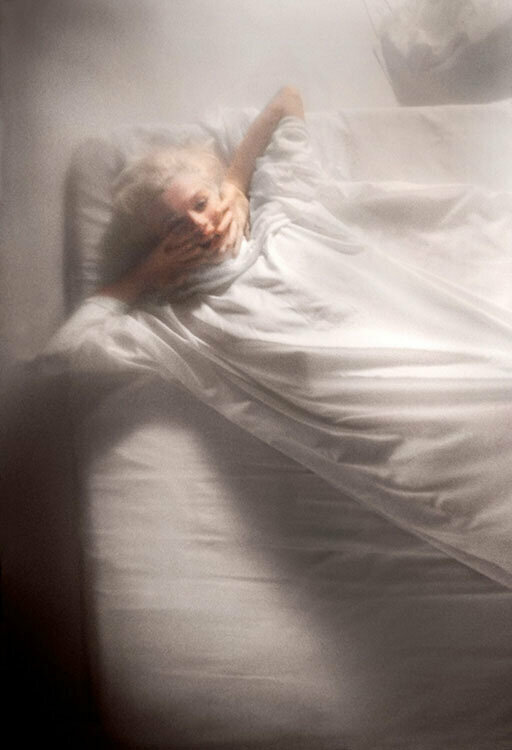 Selon Kirkland, toute cette tension sexuelle a permis de livrer de bonnes photos. 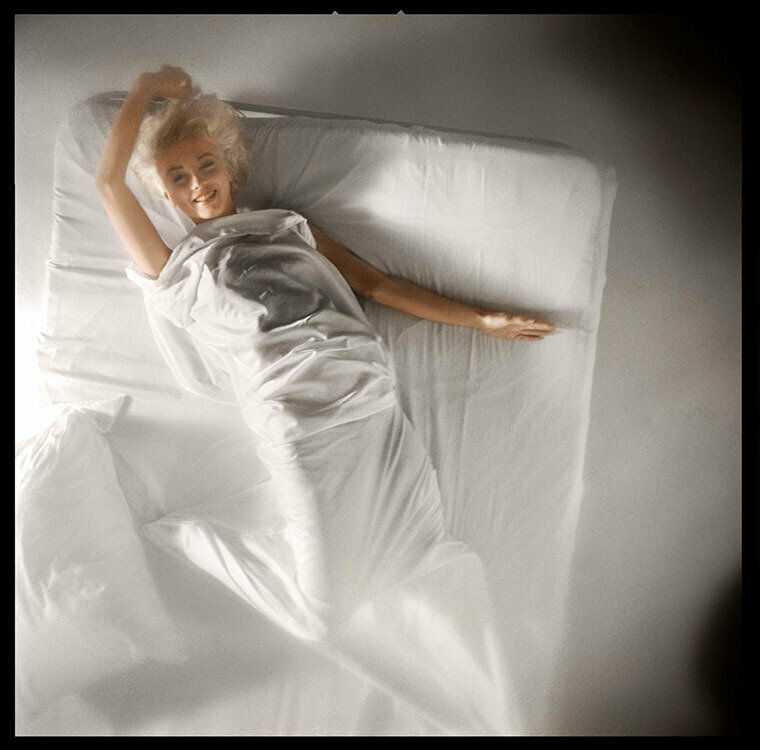 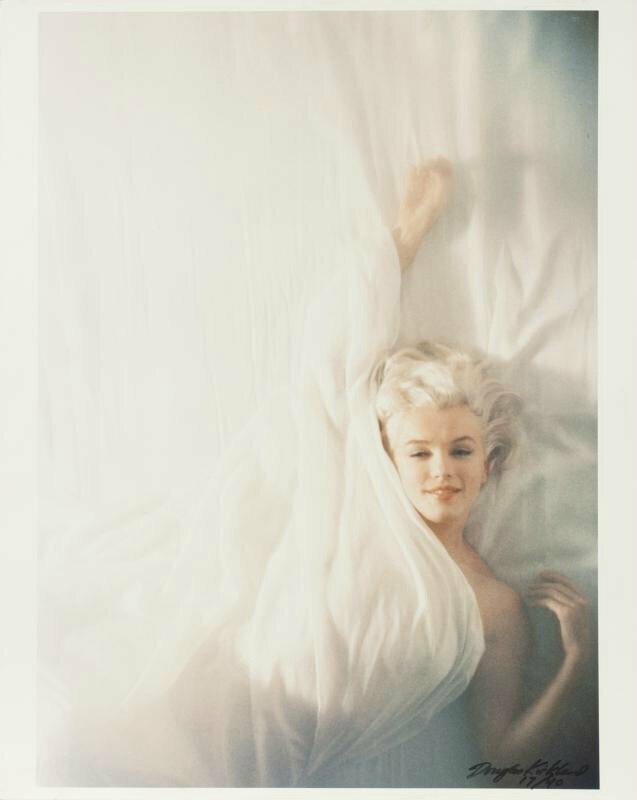 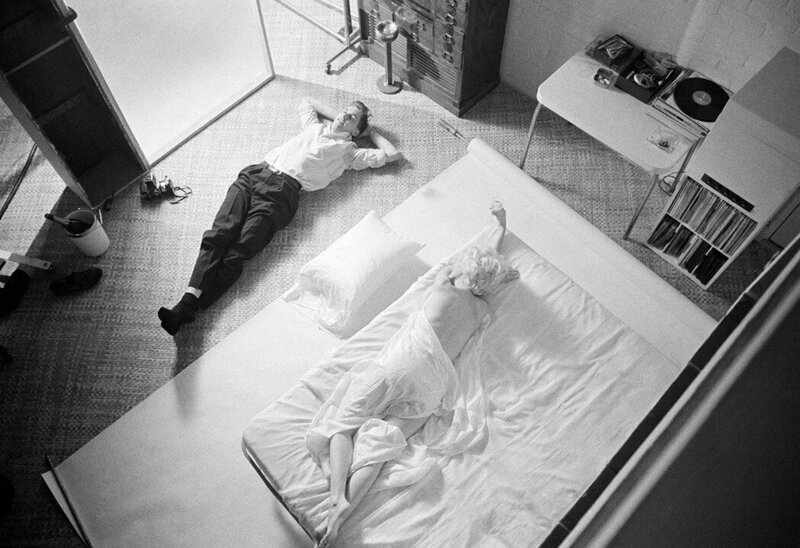 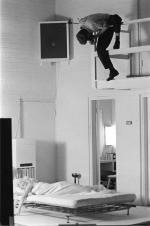 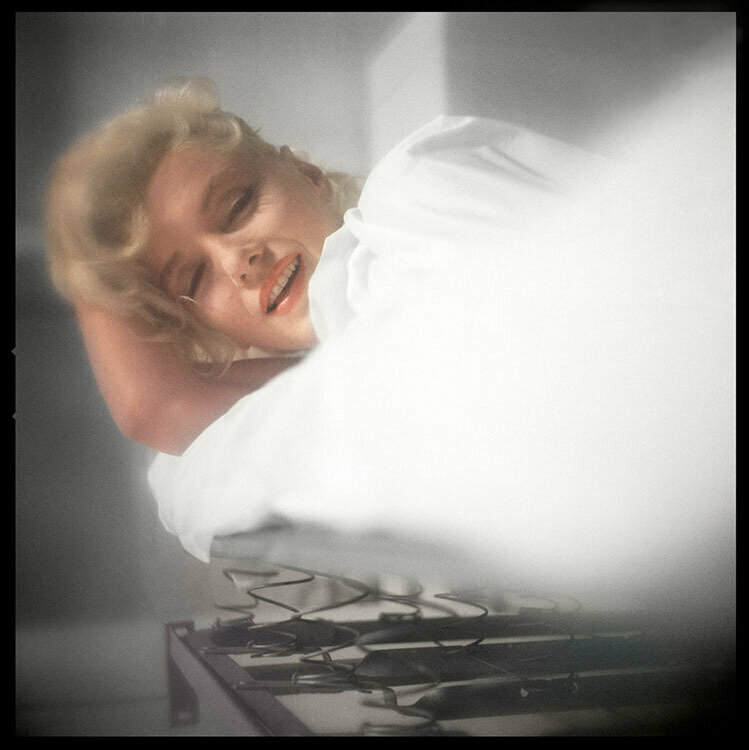 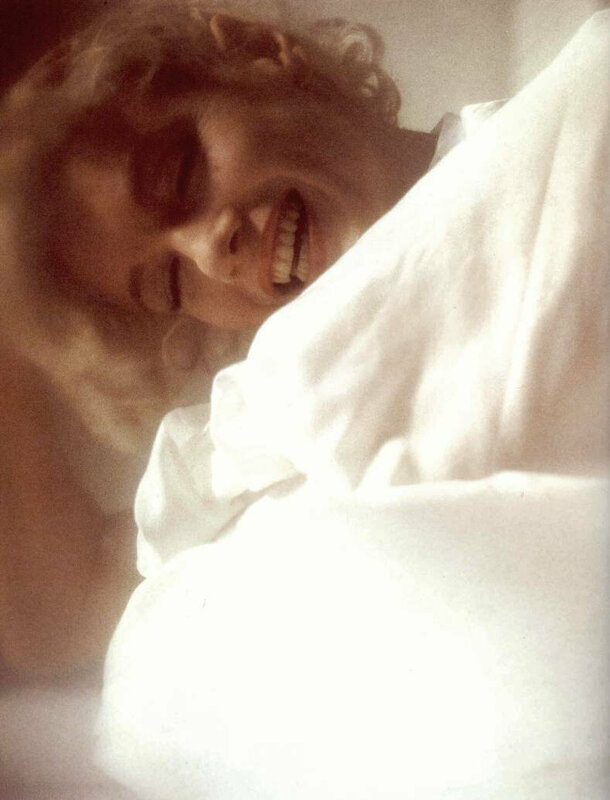 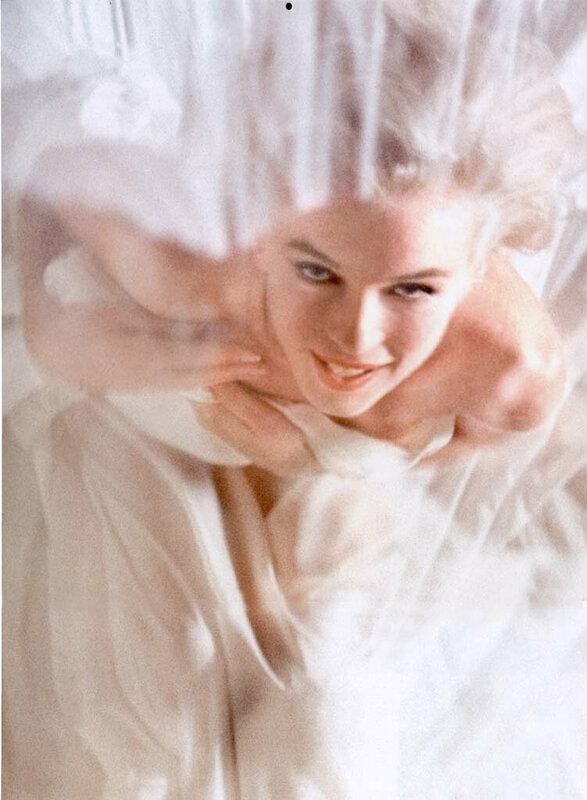 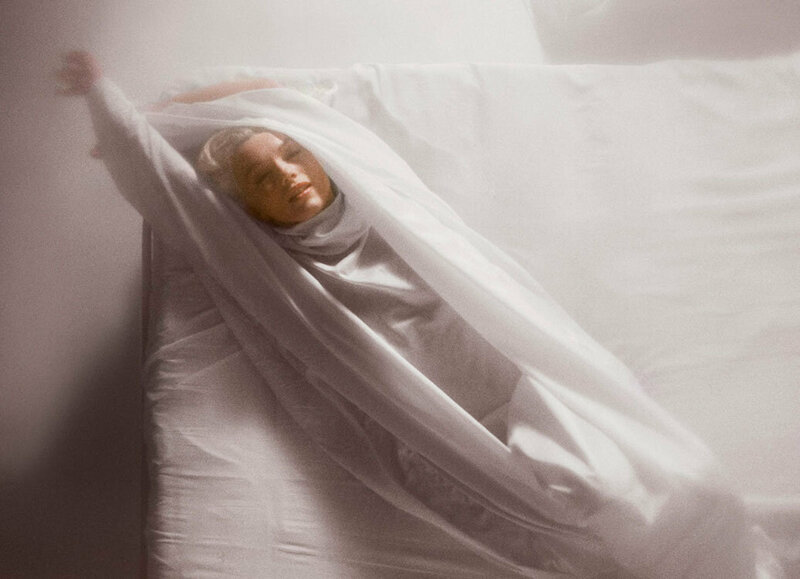 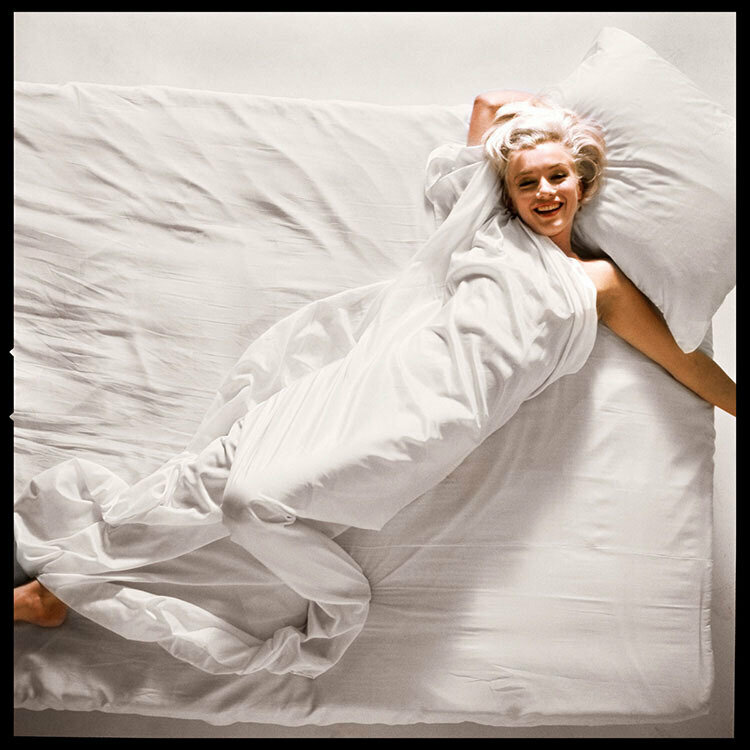 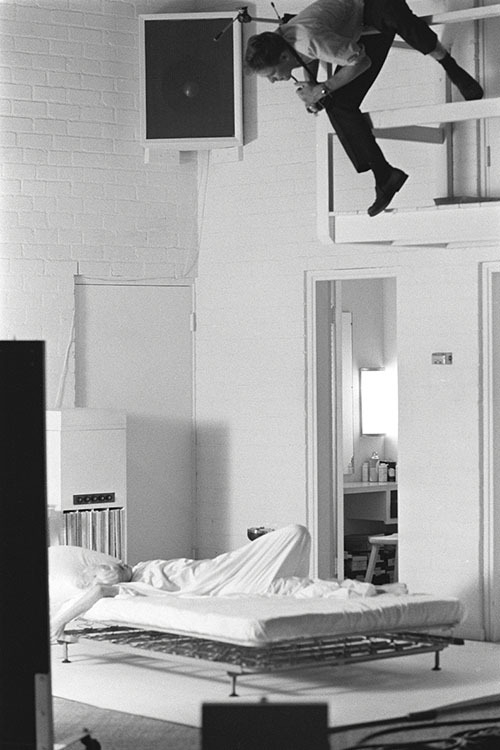 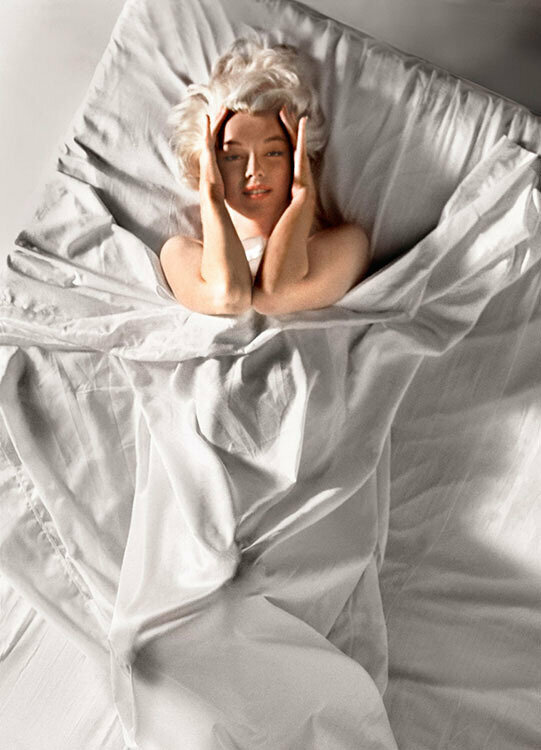 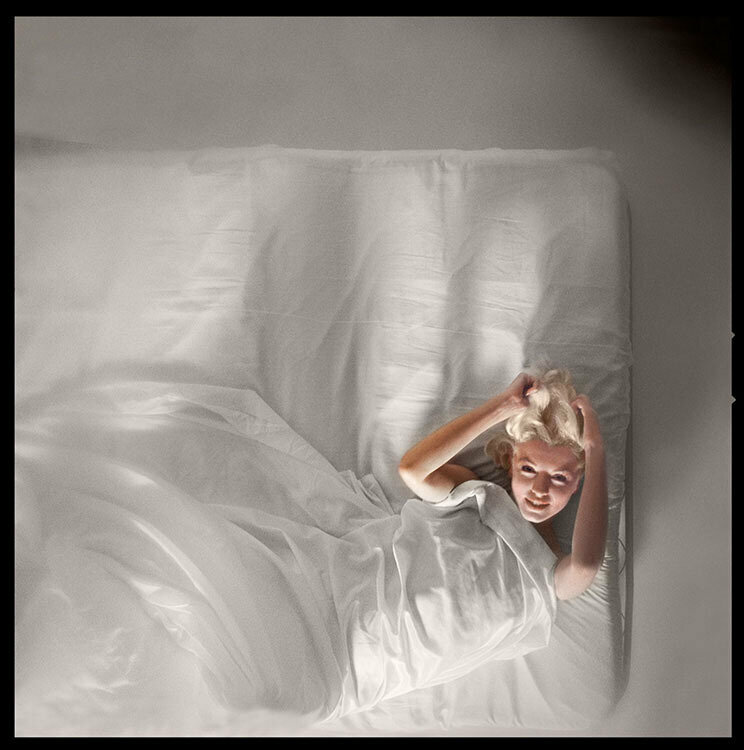 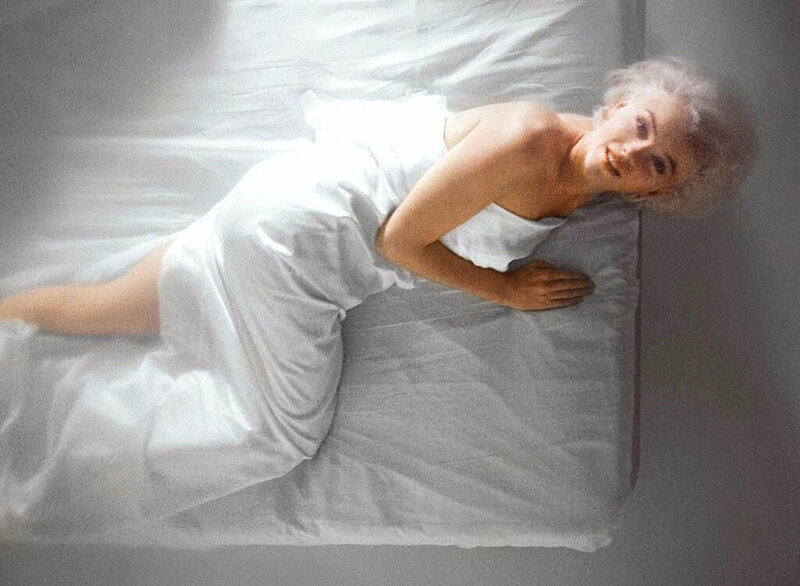 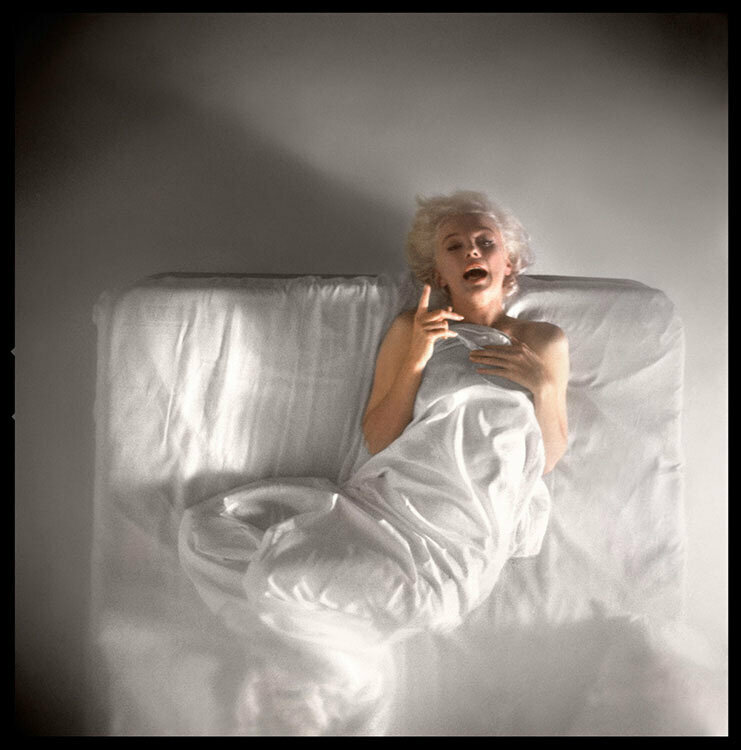 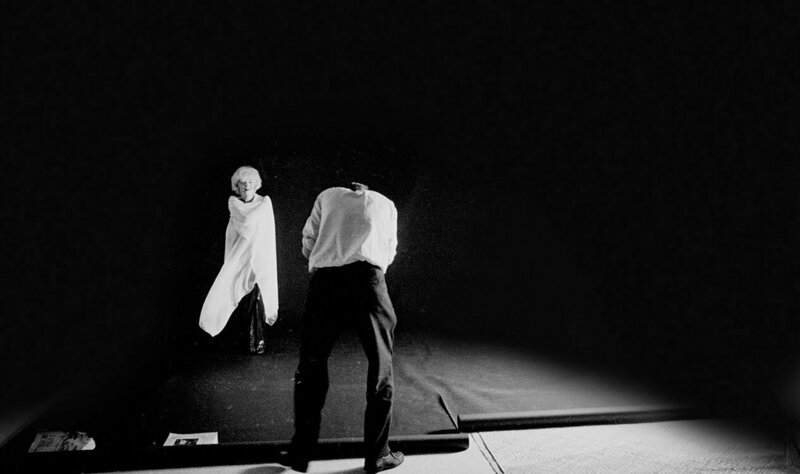 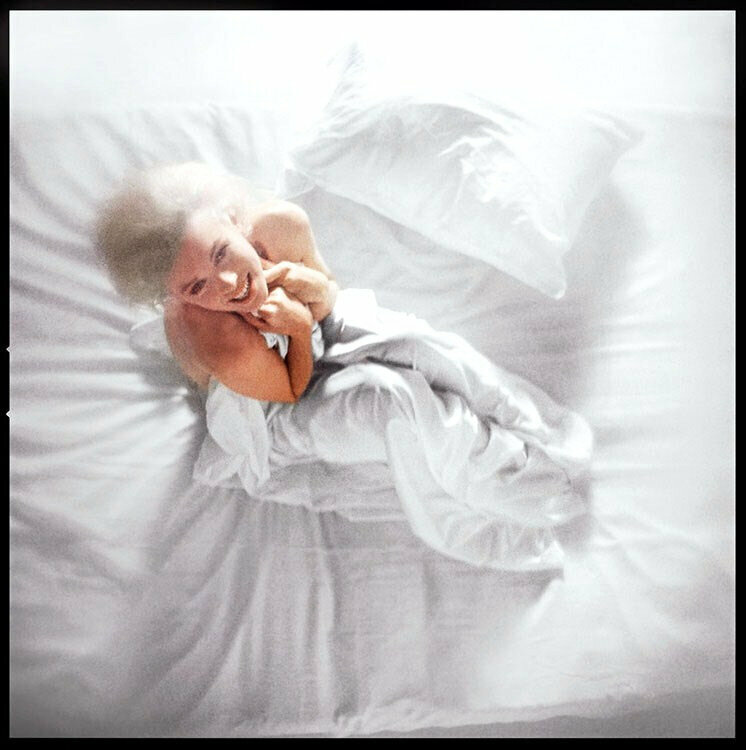 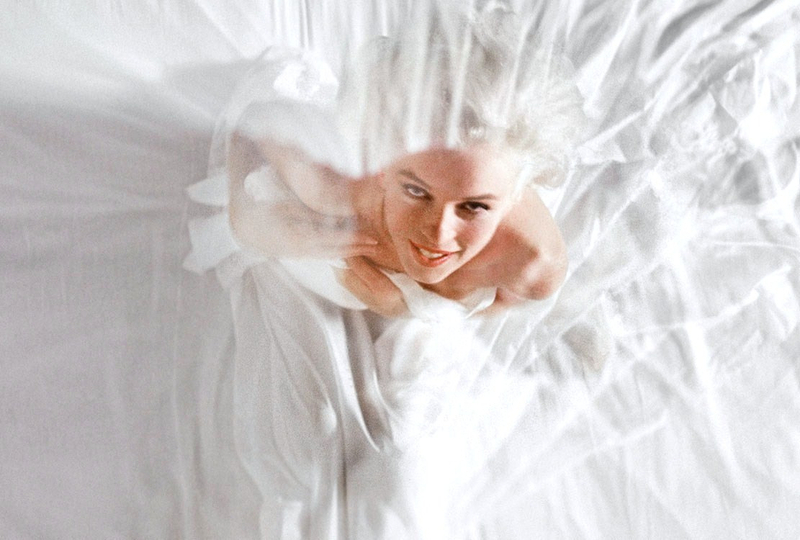 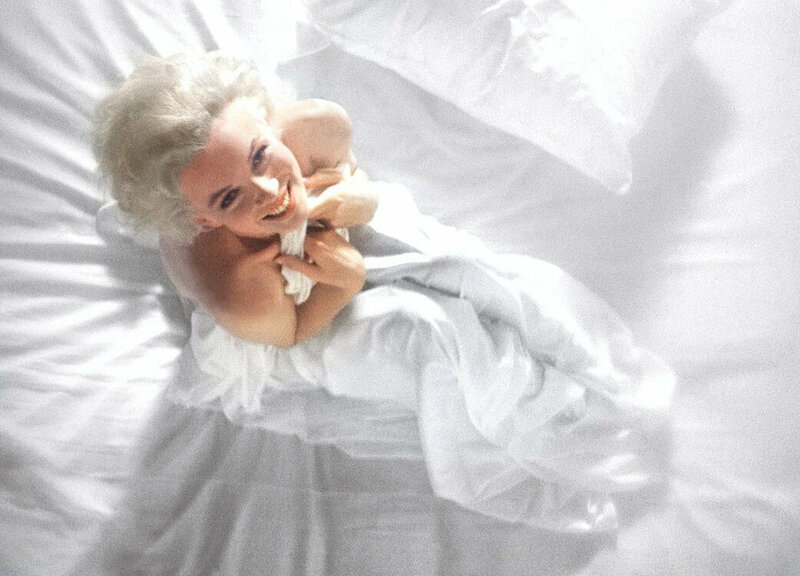 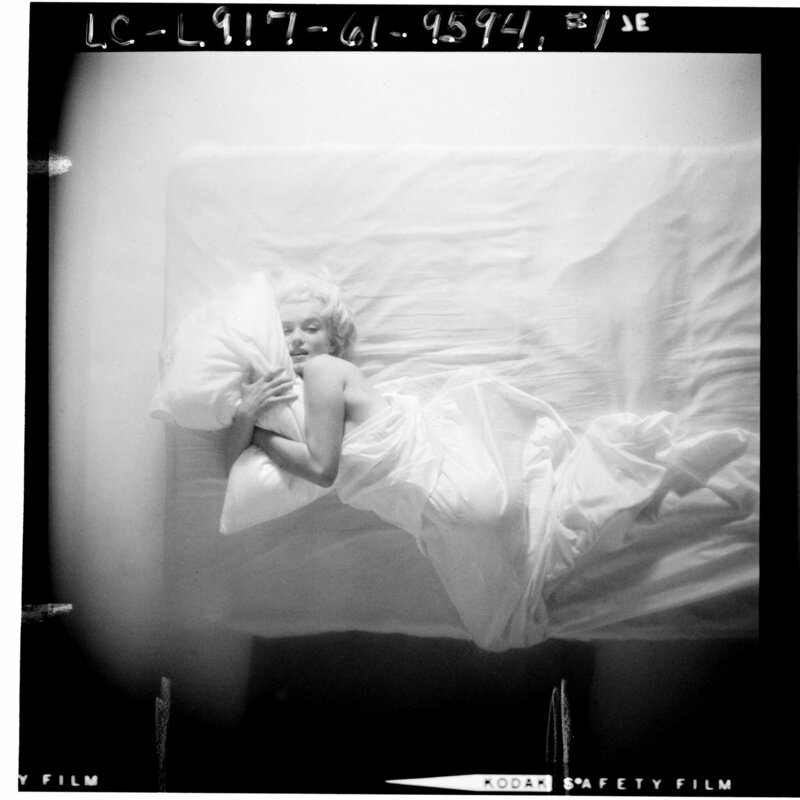 Douglas Kirkland takes Marilyn to the unmade bed of white silk sheets and asks her to imagine how she would like to be remembered in 25 years, because the photo was to celebrate the 25th anniversary of Look magazine. 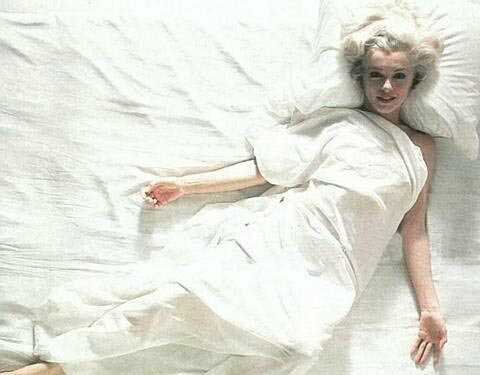 Marilyn goes back to her dressing room and comes out in a white bathrobe, which she pulls out to slip into the silk sheets. 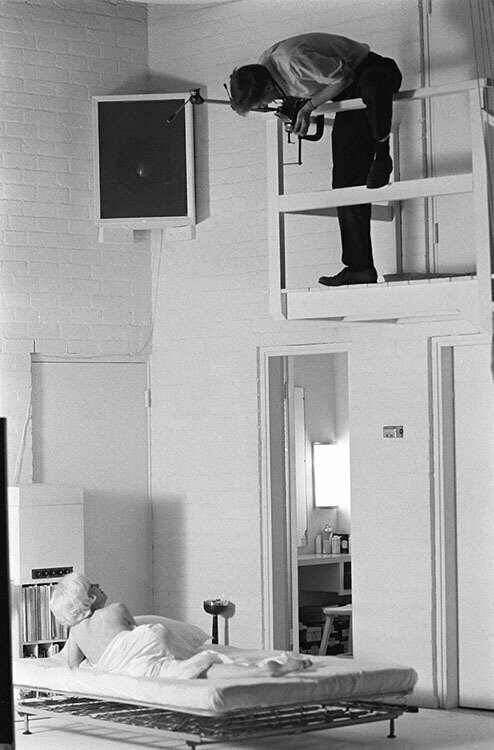 While Kirkland photographs her, perched on the balcony, she drinks a few cups of champagne. 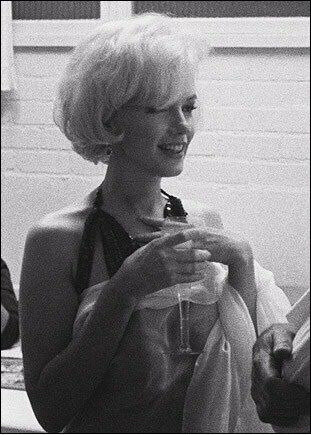 Sometimes Kirkland stops and drinks with her. 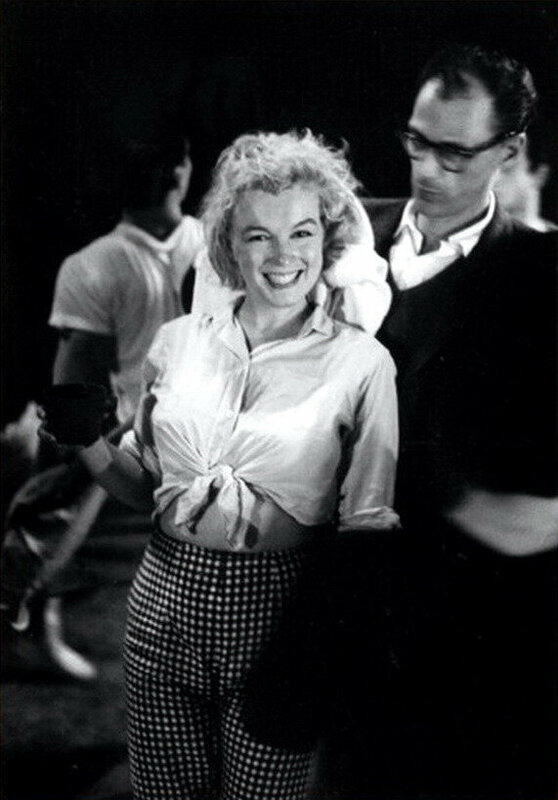 In the middle of the session, she asks the rest of the team to leave her alone with the photographer: "Usually, it works better like that !" 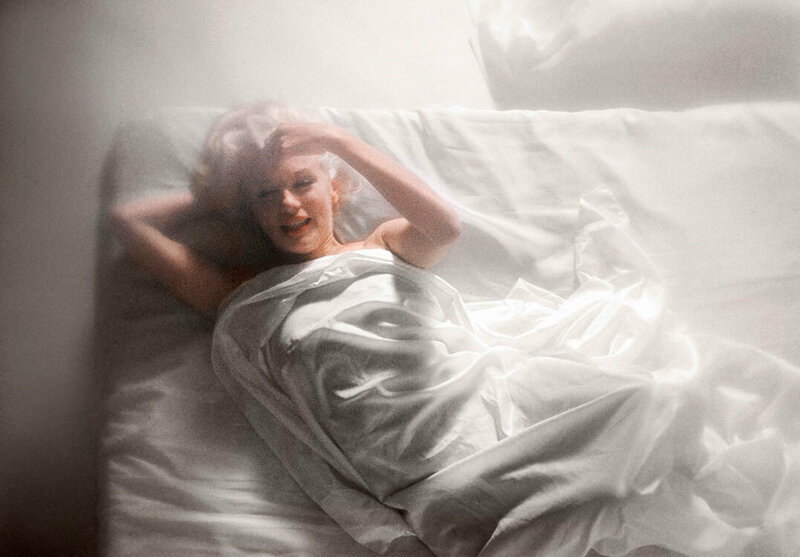 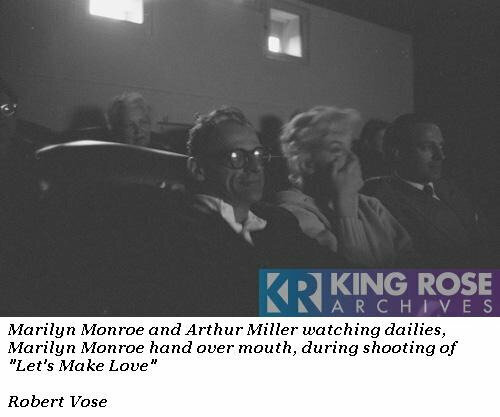 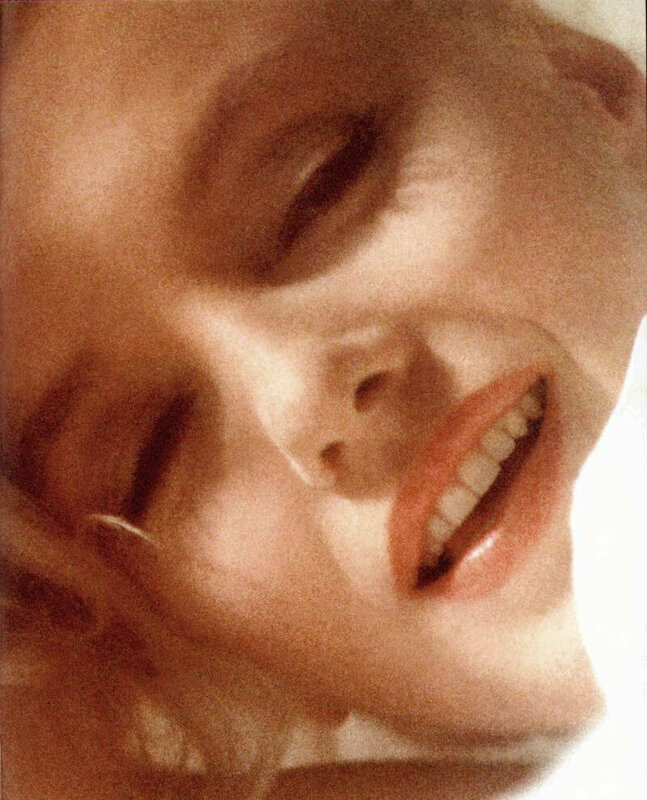 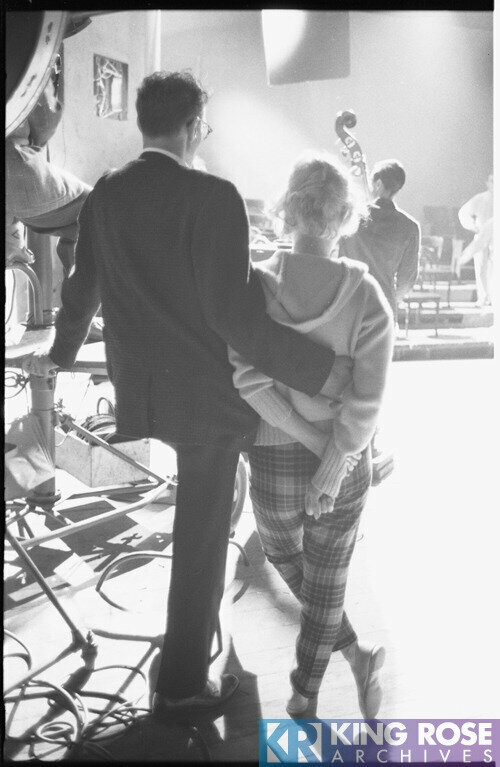 For Kirkland, it was then "A very intimate experience (...) Everything was now played between Marilyn, my camera and me (...) The atmosphere was calm, sweet and seductive." 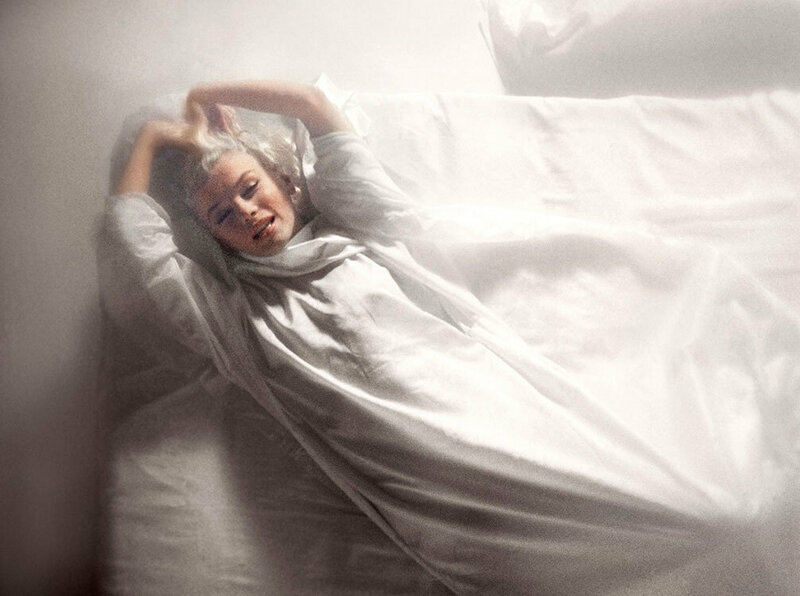 According to Kirkland, Marilyn asks him to join her in the bed; he explains that although he wanted to do it, he was married with three children and his good conscience made him refuse the offer. 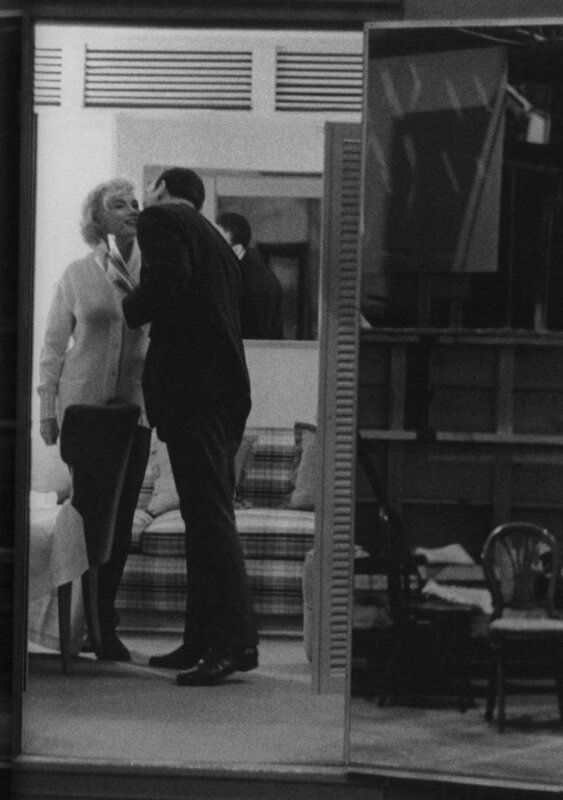 According to Kirkland, all this sexual tension allowed to deliver good photos. 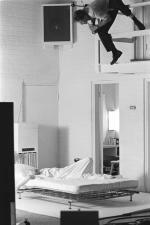 Quand il a terminé, il la rejoint et s'allonge par terre à côté du lit pour discuter seuls une vingtaine de minutes avant de refaire entrer les autres. 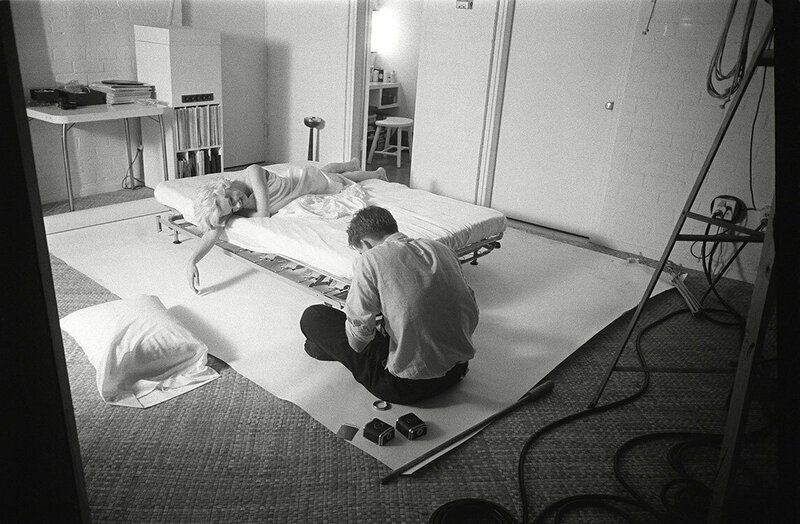 Son assistant a pris quelques photos. 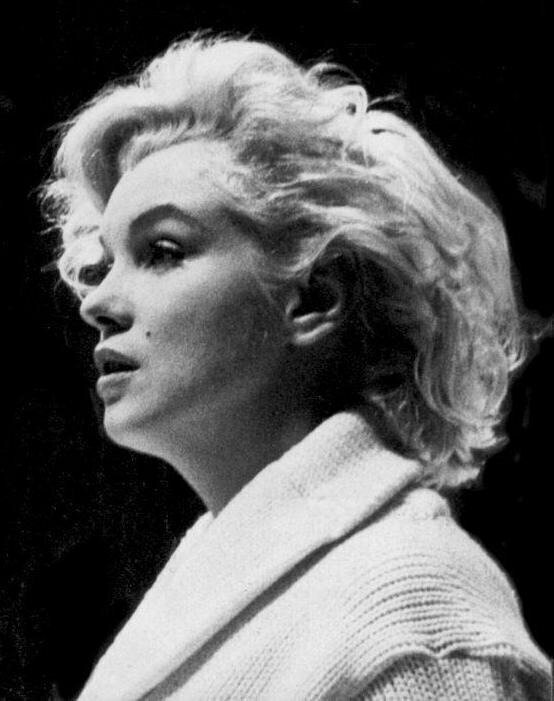 Puis Marilyn remet son peignoir et retourne dans sa loge. 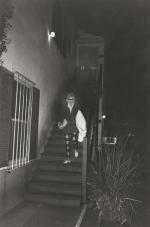 Elle part peu après minuit. 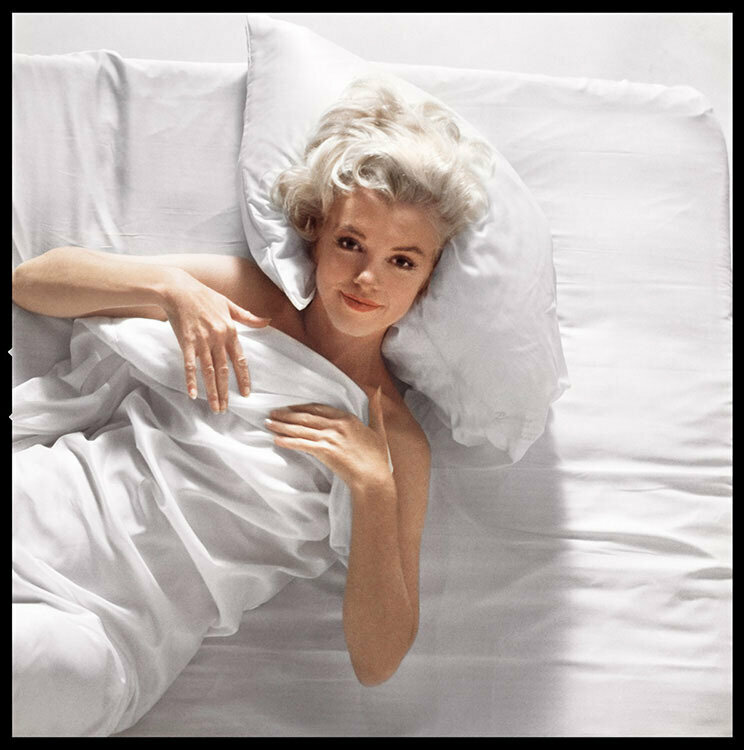 Elle prend rendez-vous avec Kirkland le lendemain après midi chez elle pour visionner les photos. 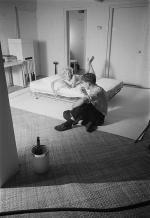 When he has finished, he joins her and lies on the floor next to the bed to discuss about twenty minutes before the others enter. 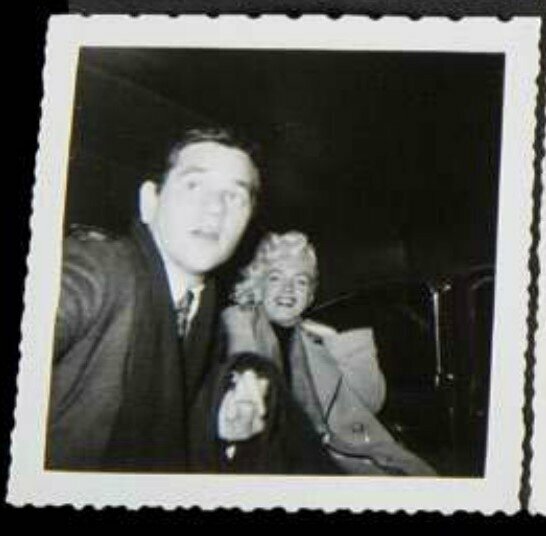 His assistant took some photos. 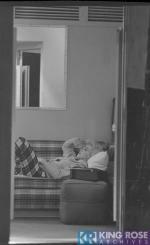 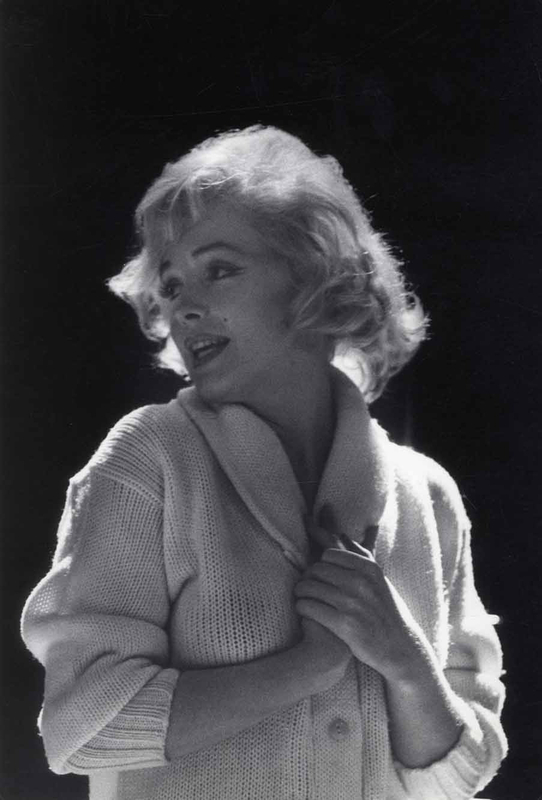 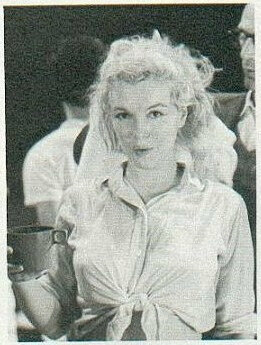 Then Marilyn puts on her bathrobe and goes back to her dressing room. 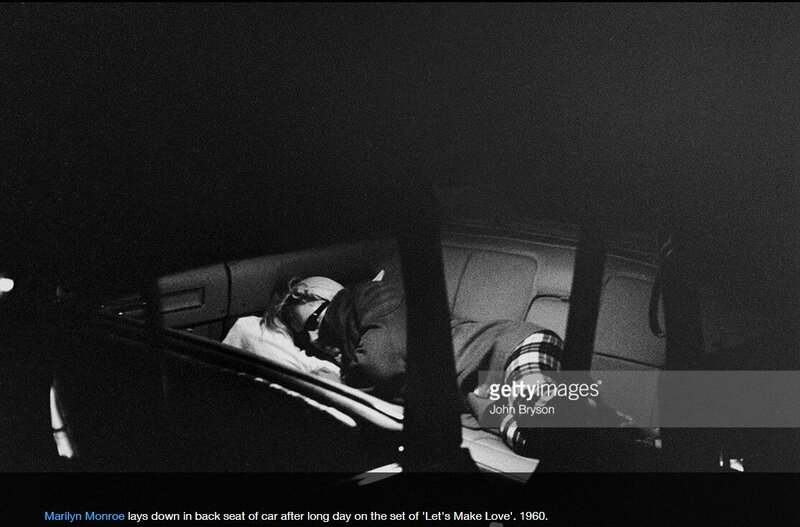 She leaves the studio shortly after midnight. 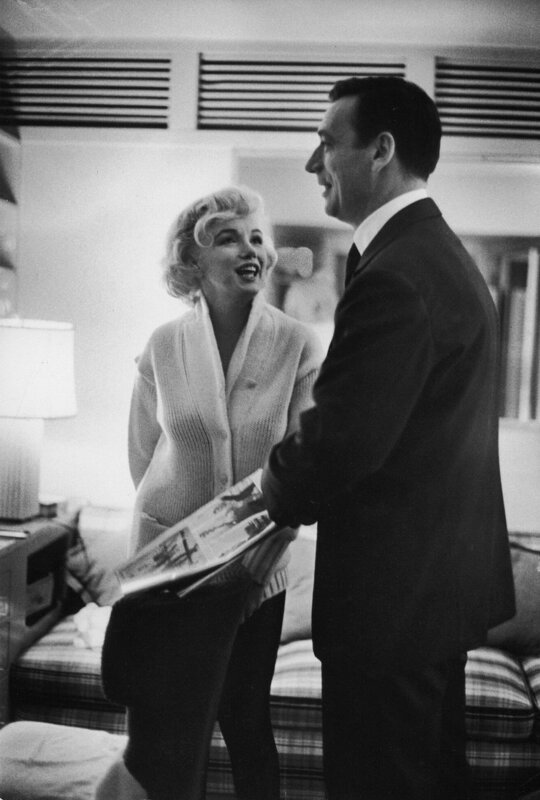 She makes an appointment with Kirkland the next day afternoon at home to view the photos. 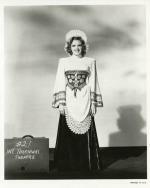 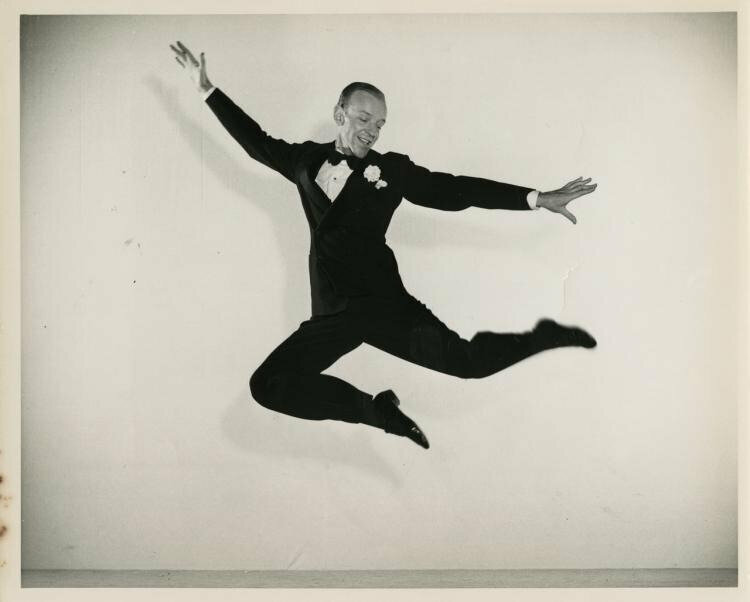 Lot 394: Debbie Reynolds Hollywood Museum (200+) costume reference photographs. 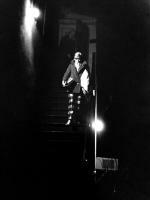 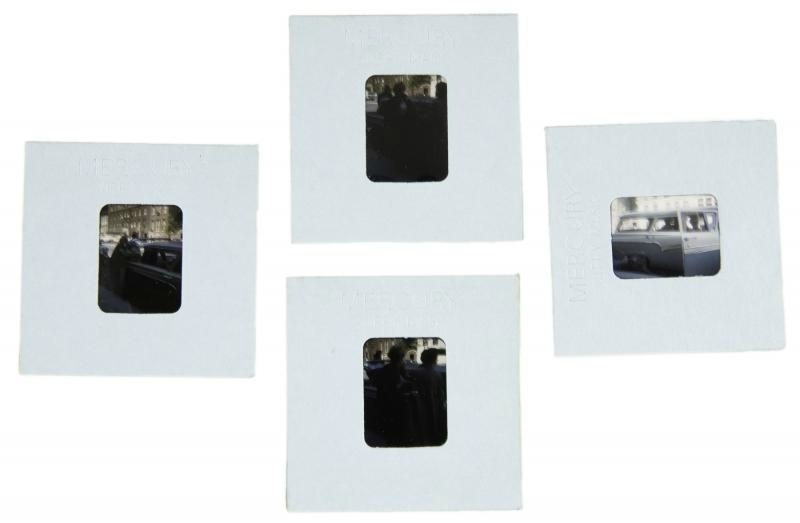 (Various Studios, 1910s-1970s, some printed later) Archive of (200+) gelatin silver primarily 8 x 10 in. 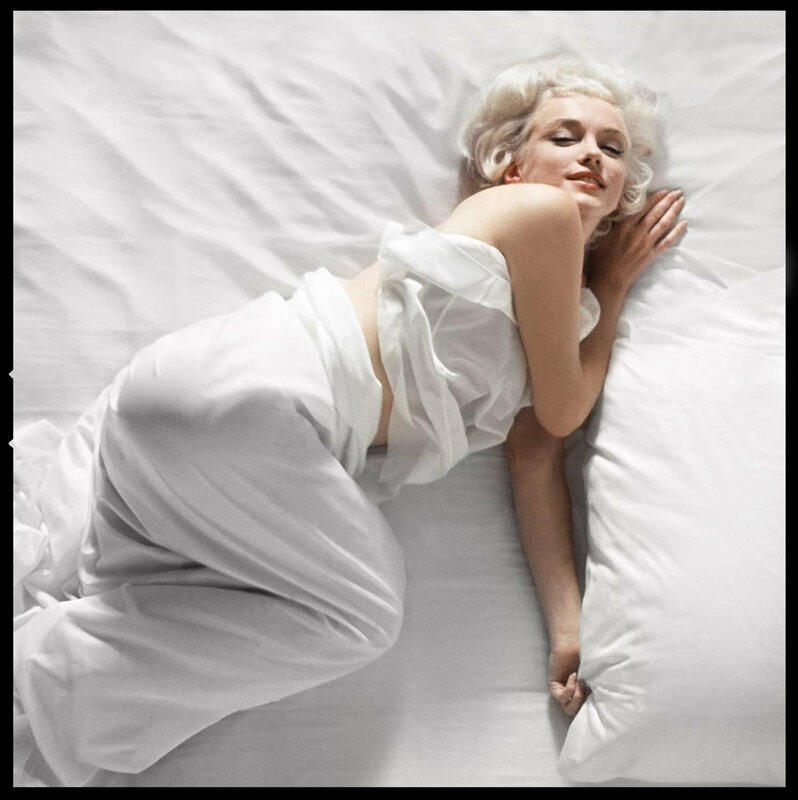 single-weight and double-weight glossy and matte production and portrait photographs covering the gamut of Golden Age Hollywood personalities and film subjects. 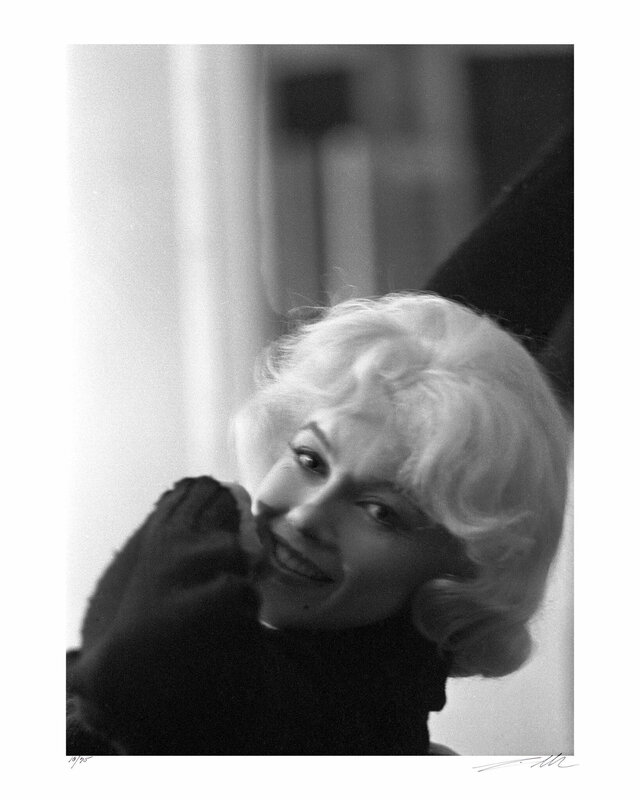 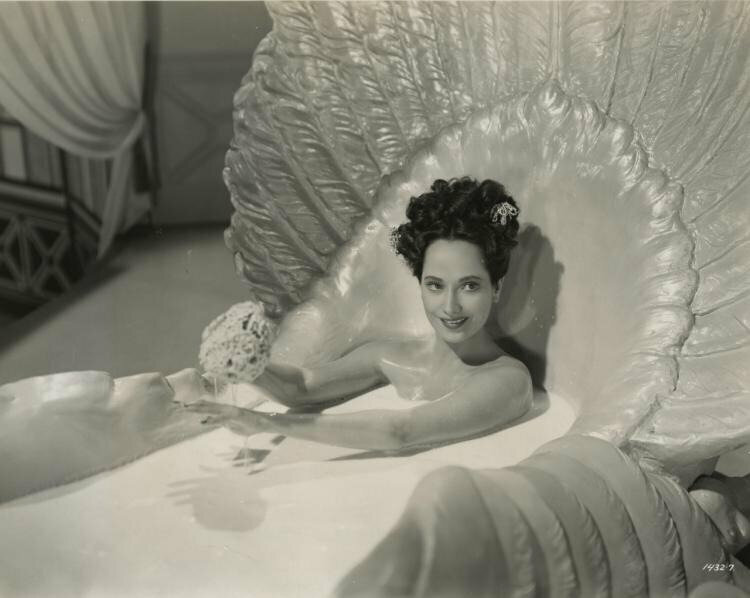 Since Reynolds began collecting well before such images were readily available with the advent of home video and later, the internet, these photos served as a vital reference for her unrivaled Hollywood costume and memorabilia collection. 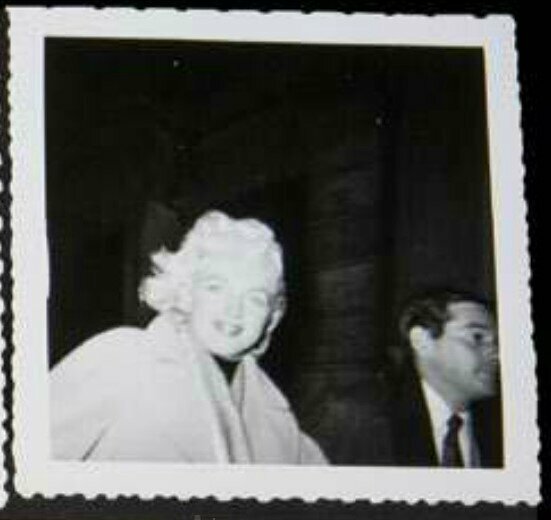 Including Marilyn Monroe, Orson Welles, W.C. Fields, Hattie McDaniel, Rita Hayworth, Merle Oberon, and many, many more. Overall, in very good to fine condition, with few exceptions. 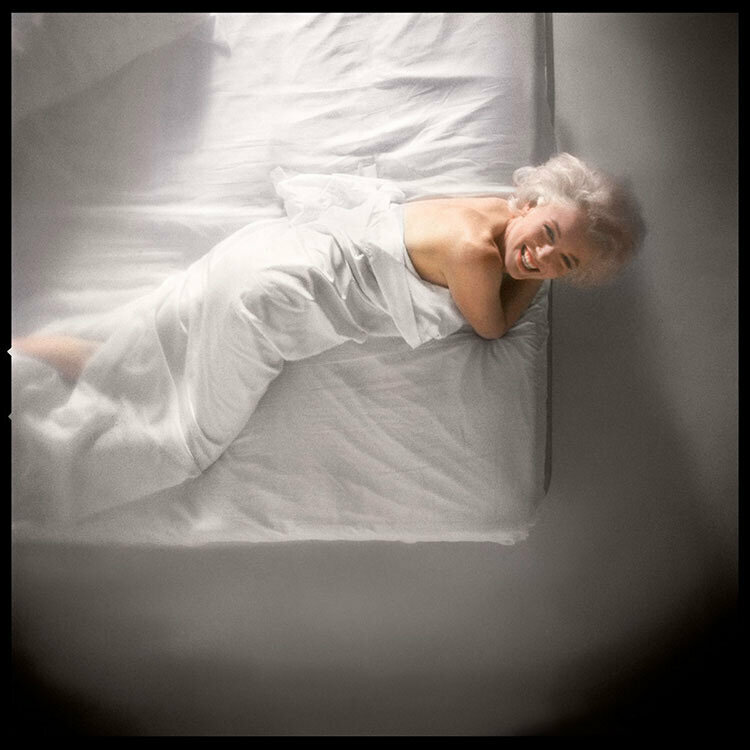 Vintage 41 x 79 in. 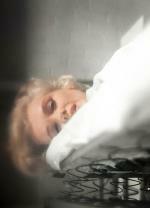 3-sheet poster. 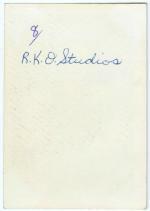 Printed in 2-segments. 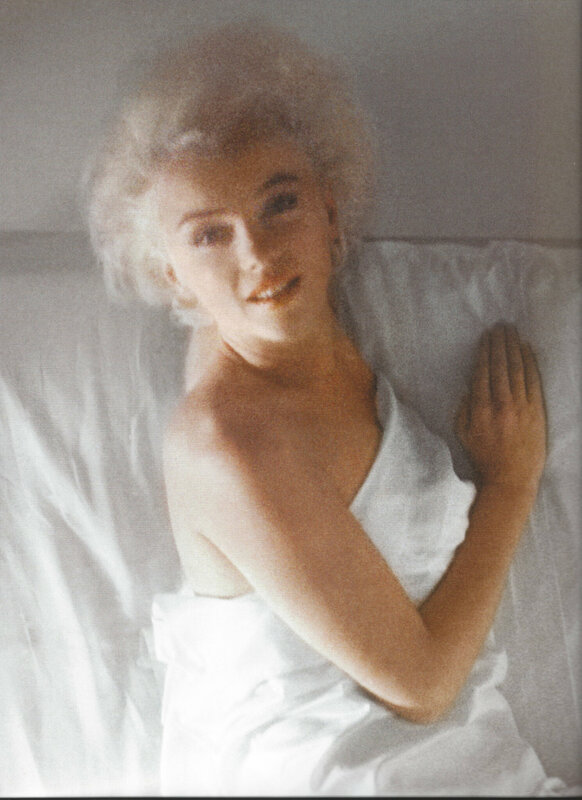 Linen-backed with minimal restoration allowing the poster to show its natural age. 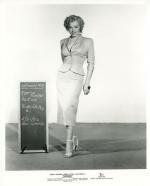 Featuring a life-size depicting of Marilyn Monroe in her showgirl costume. In vintage good to very good condition. Vintage original Niagara 14 x 36 in. 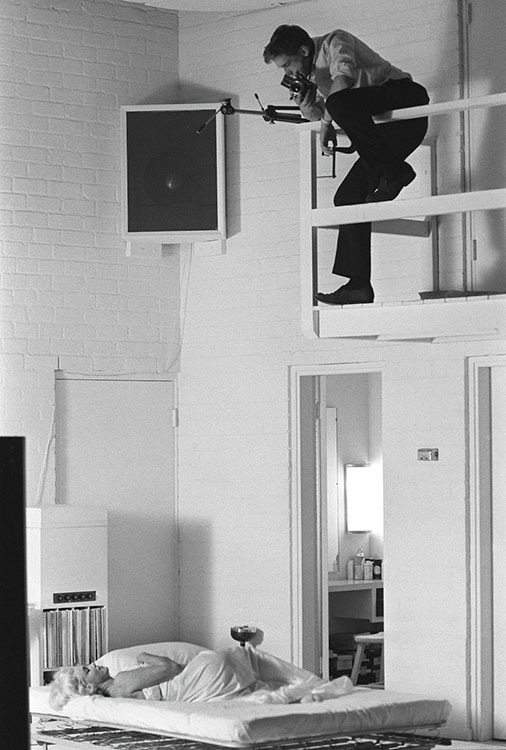 insert poster. 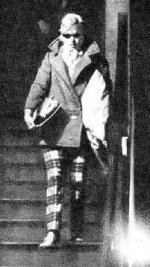 Linen-backed. Exhibiting folds, edge wear and tears, creasing and minor wrinkling to borders. 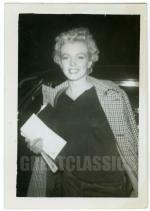 In vintage good to very good condition. 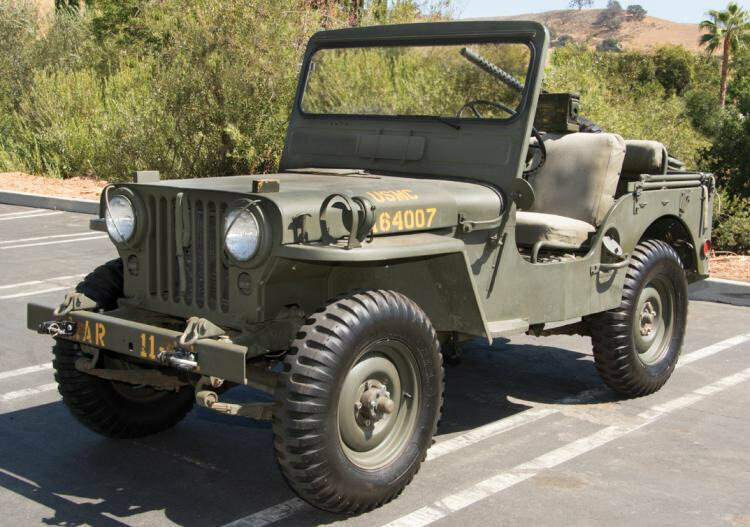 Lot 586: 20th Century Fox Willys M38 Jeep (Serial #59350). 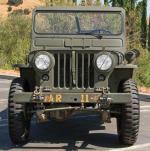 Manufactured by Willys Overland Motors Inc., Toledo, Ohio and delivered to the military in March 1952. 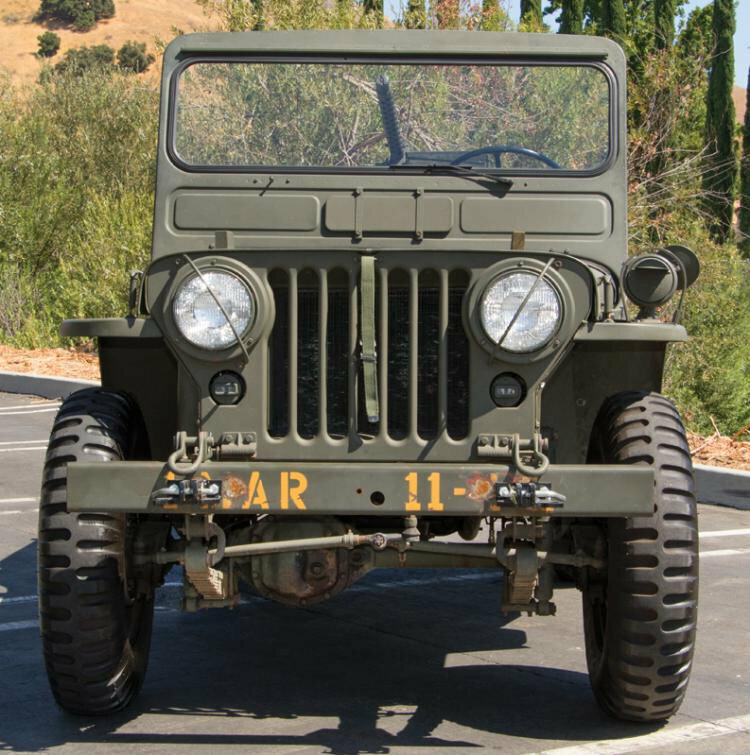 The Willys M38 was introduced in 1950 as a post-WWII military Jeep, being a ¼ ton 4 x 4 utility truck, serving as a light tactical vehicle. 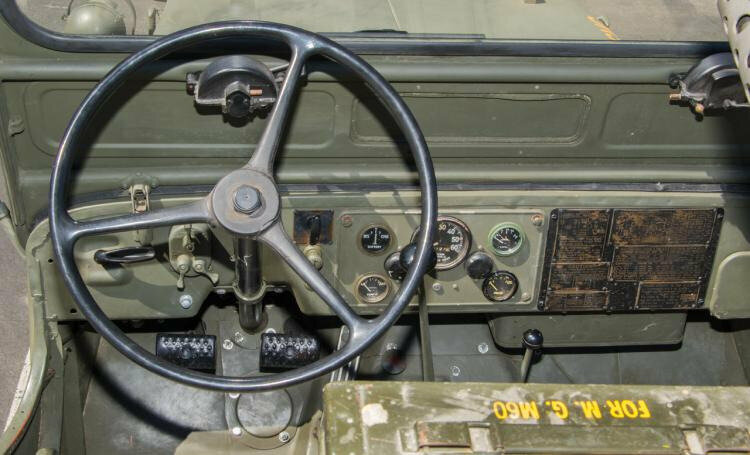 The M38 is outfitted with “pioneer” tools (axe and shovel) mounted on the passenger side, protruding headlights with guard wires, air vent in base of windshield and blackout lights. 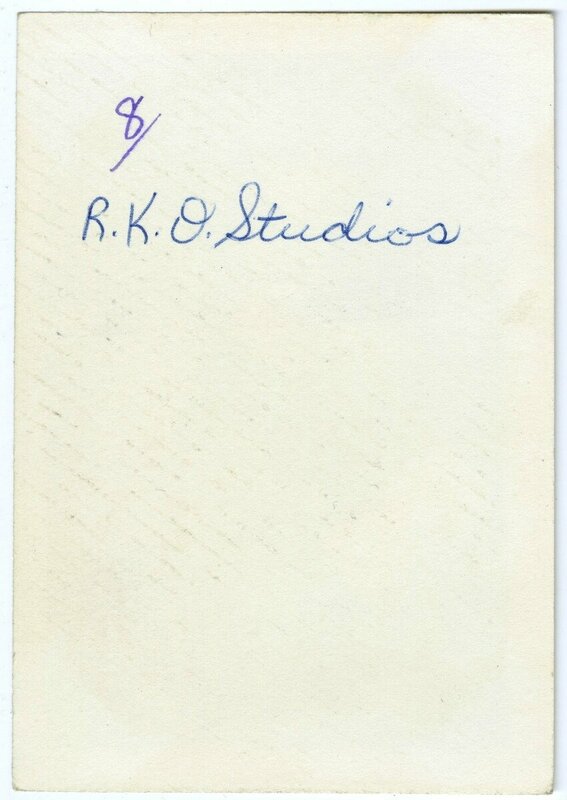 Powered by a 2199 cc. 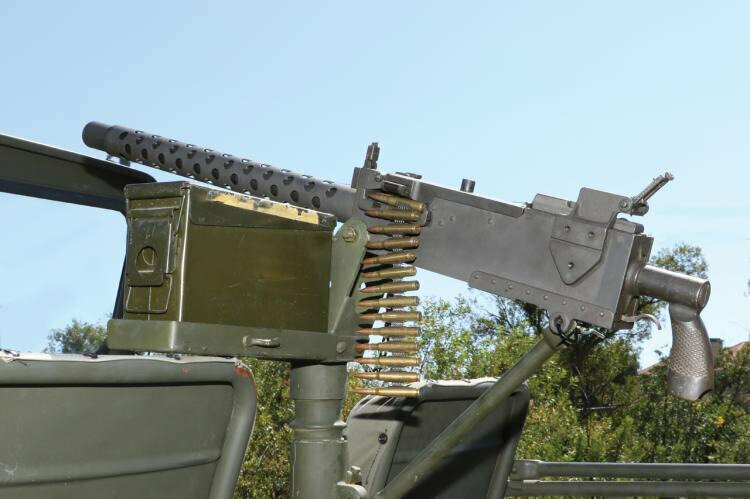 inline 4-cylinder engine mated to a 3-speed manual transmission with 2-range transfer case and, unique to the M38, features a front-end differential disengagement lever operated from the inside. 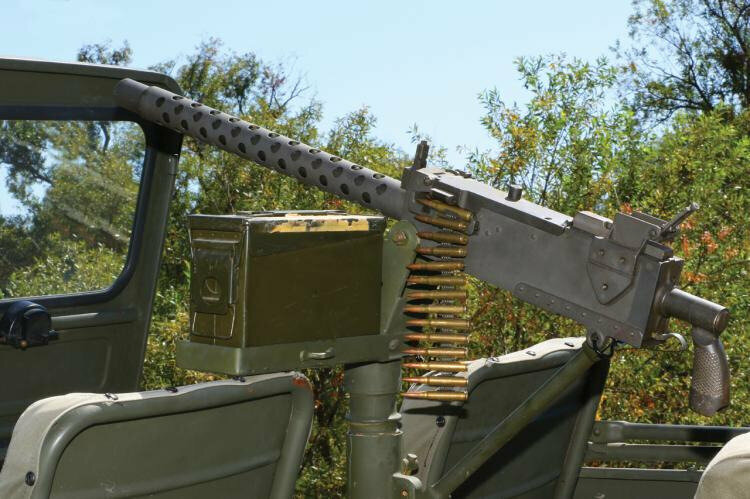 Features a studio-mounted non-firing de-milled prop .30-caliber Browning 1919 machine gun. 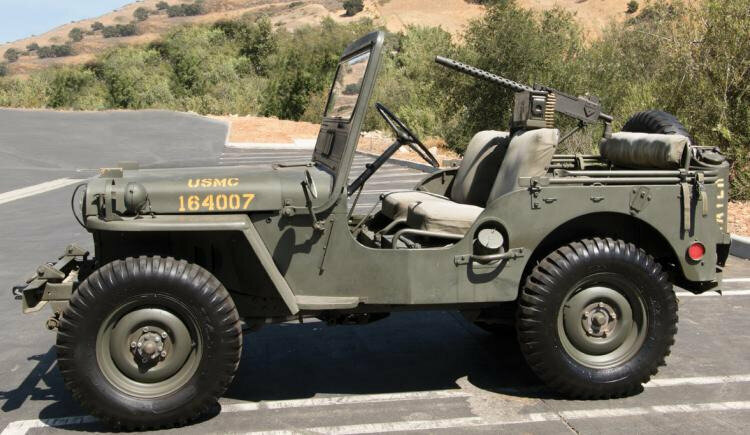 Due to the relatively minor cosmetic differences between their WWII counterparts, M38 Jeeps were regularly used by the studios for WWII films as well as those depicting the Korean War. 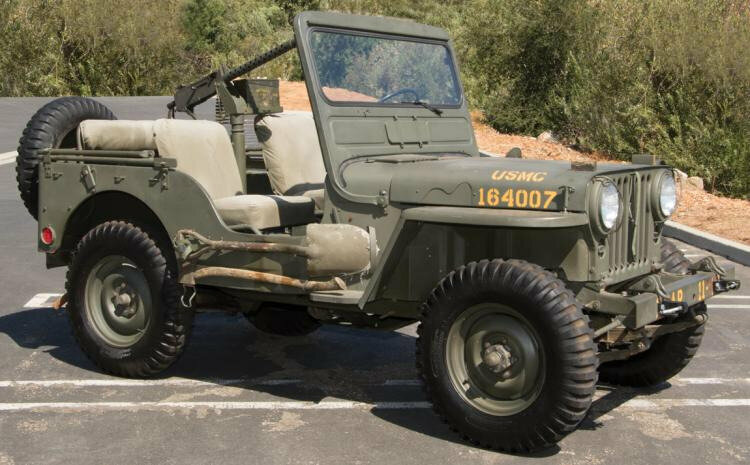 Although we are unable to definitively tie its use to any particular film, this Jeep was likely used in filming M*A*S*H (1970). 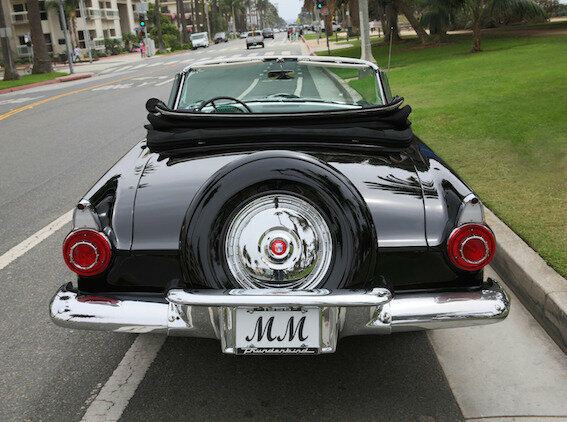 The odometer reads an unverified 36,127 miles. 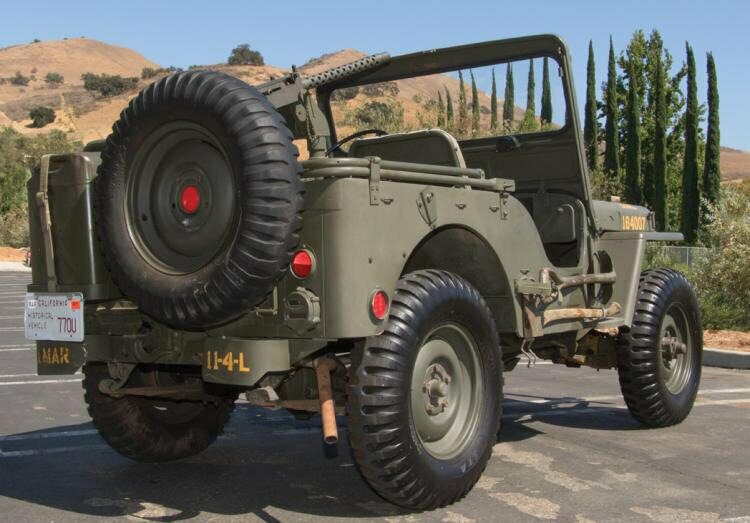 This M38 underwent both cosmetic and mechanical restoration in 2008 as well as a recent brake rebuild. 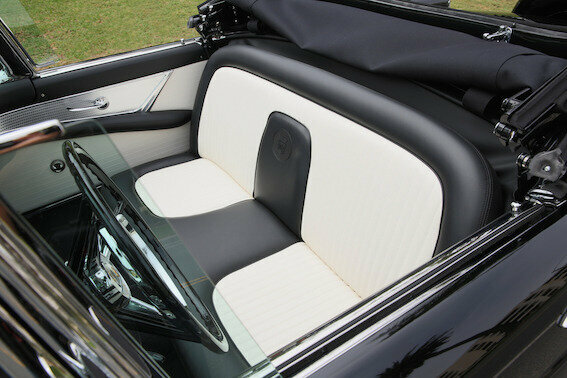 Electrical system has been restored to original 24-volt specifications. 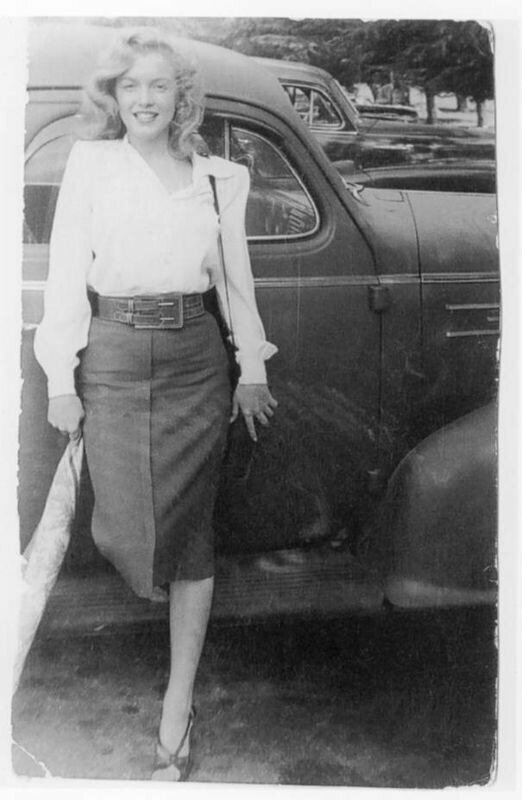 This Jeep was brought to Telluride, Colorado and driven all over town for the premiere of Bright Lights: Starring Carrie Fisher and Debbie Reynolds. 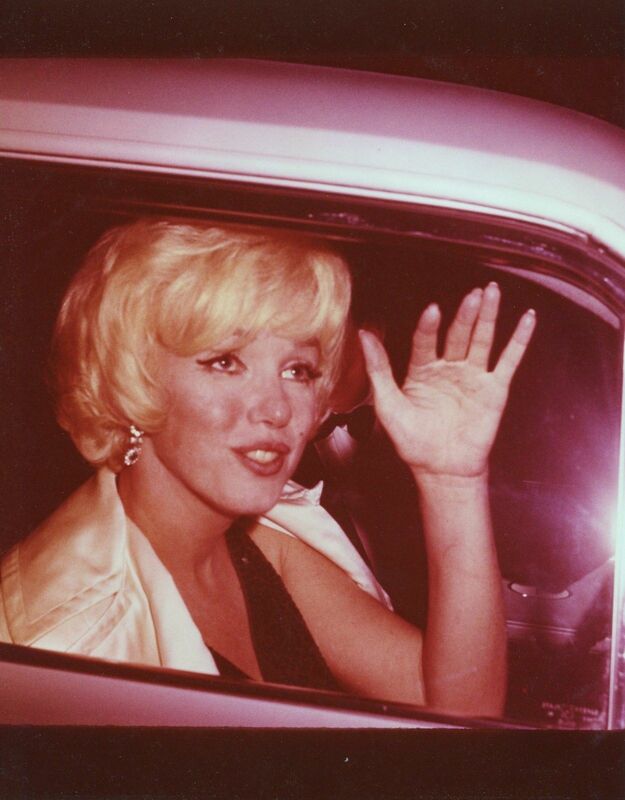 Debbie purchased this Jeep from 20th Century Fox with the Marilyn Monroe 1952 MG TD from Monkey Business. Mechanicals untested. 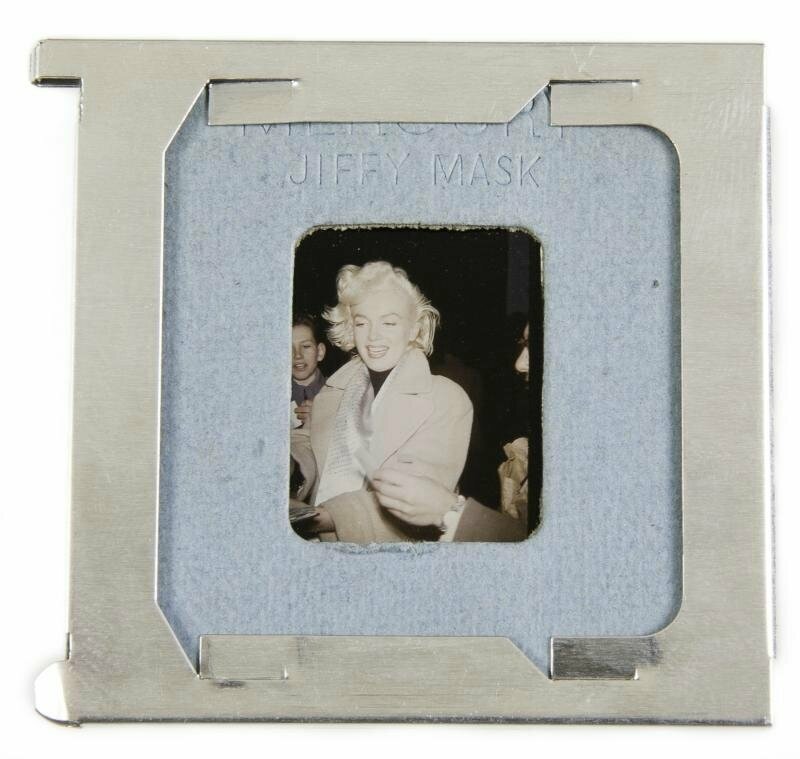 Measures 133 in. 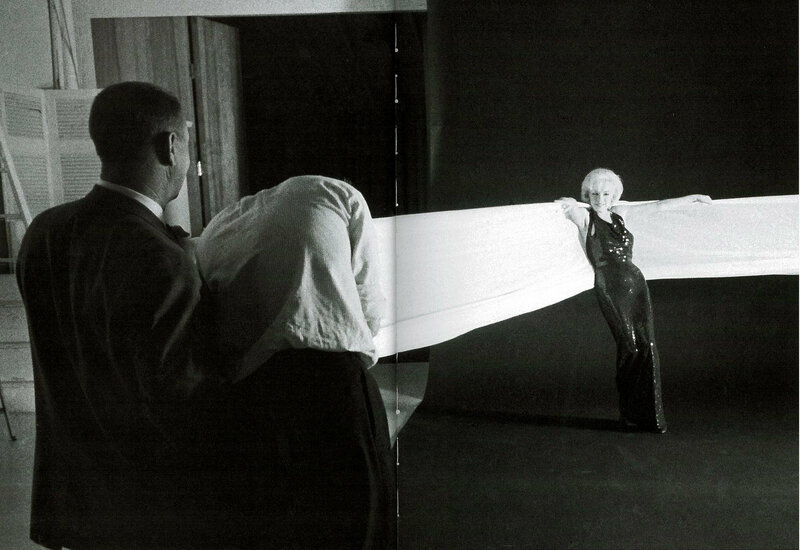 long x 62 in. 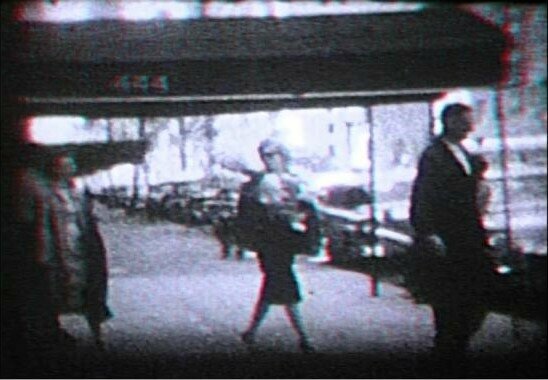 wide x 62 in. tall. 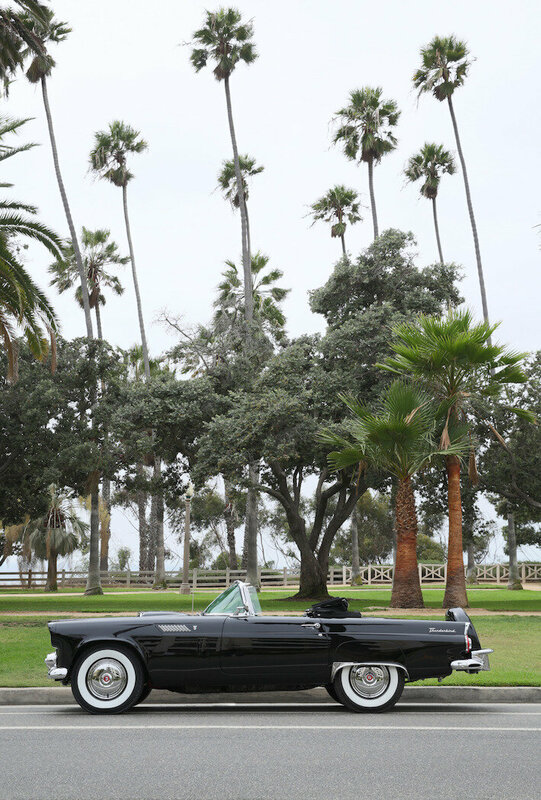 Registered as a “Historical Vehicle” in California. 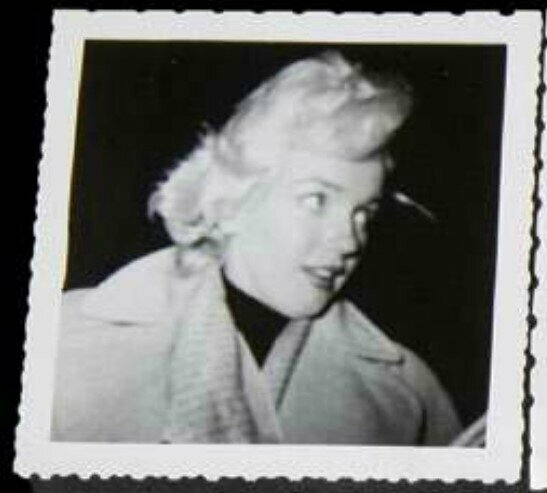 In vintage good condition. 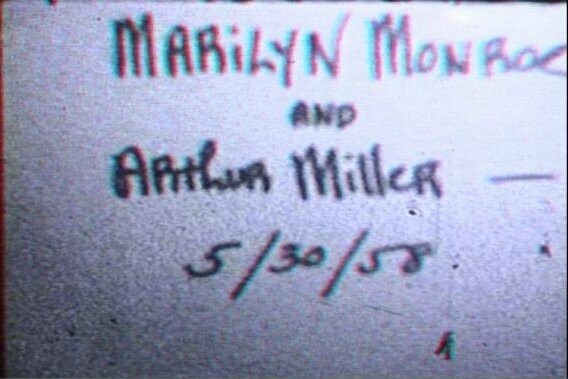 Le 30 mai 1958, Marilyn Monroe sort de son appartement au 444 East 57th Street de New York. 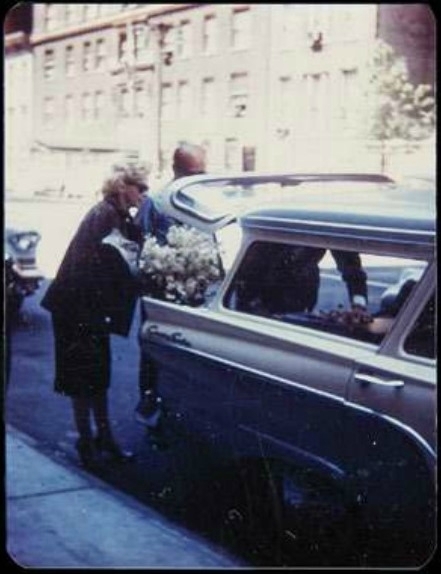 Avec Arthur Miller, ils portent un bouquet de fleurs et des valises qu'ils mettent dans une voiture puis ils partent. 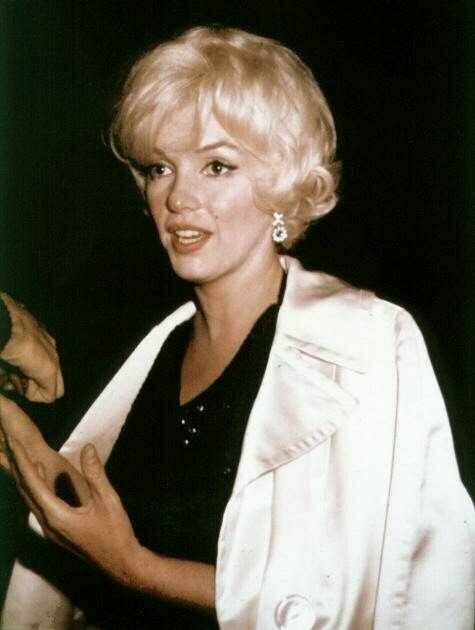 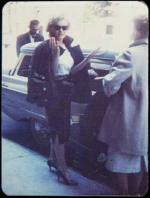 On May, 30, 1958, Marilyn Monroe exited her apartment at 444 East 57th Street in New York. 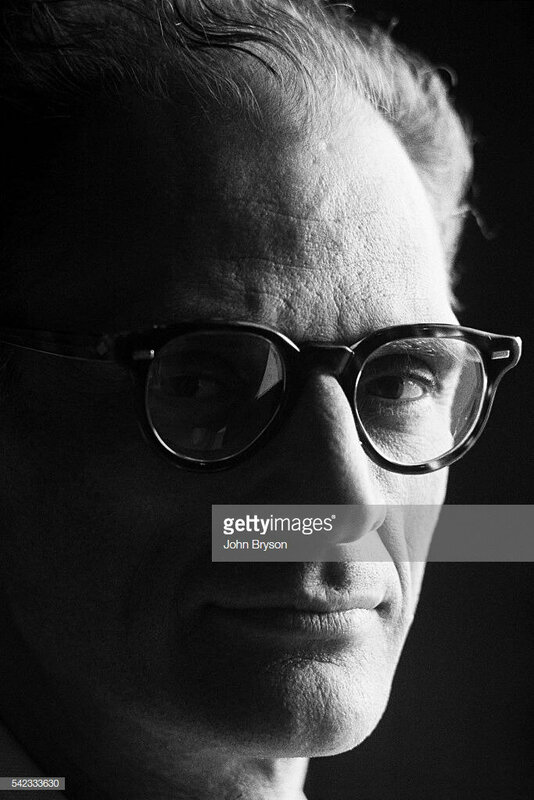 With Arthur Miller, they carry a large bouquet of flowers and luggages into a station wagon and then depart.